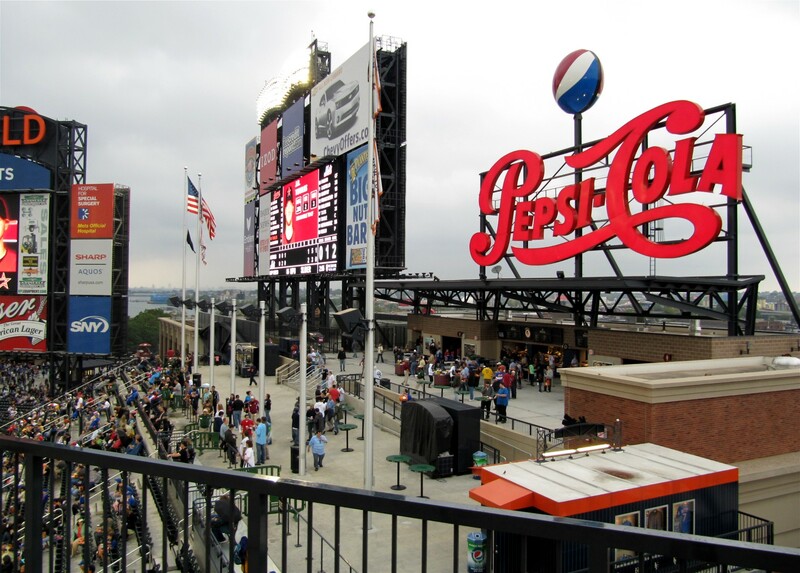 …and a game between the Atlanta Braves and the New York Mets. 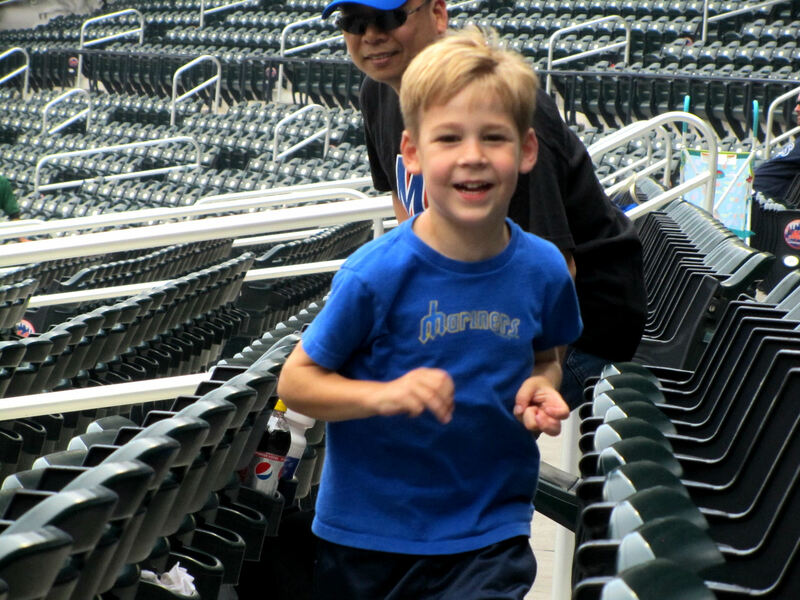 Our travels took longer than we expected, so we missed all of the Mets BP and arrived probably half way through the Braves BP. 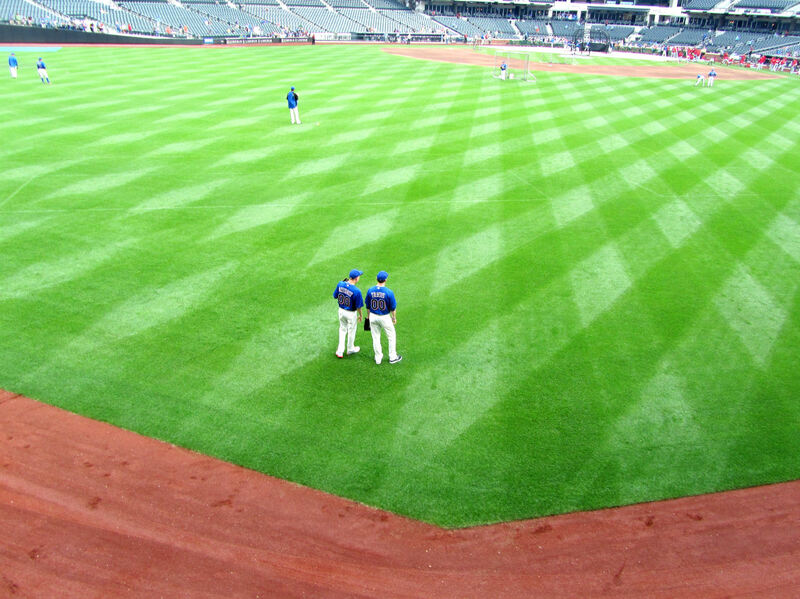 We headed down the 3B line toward the LF corner and grabbed a spot to watch the action. 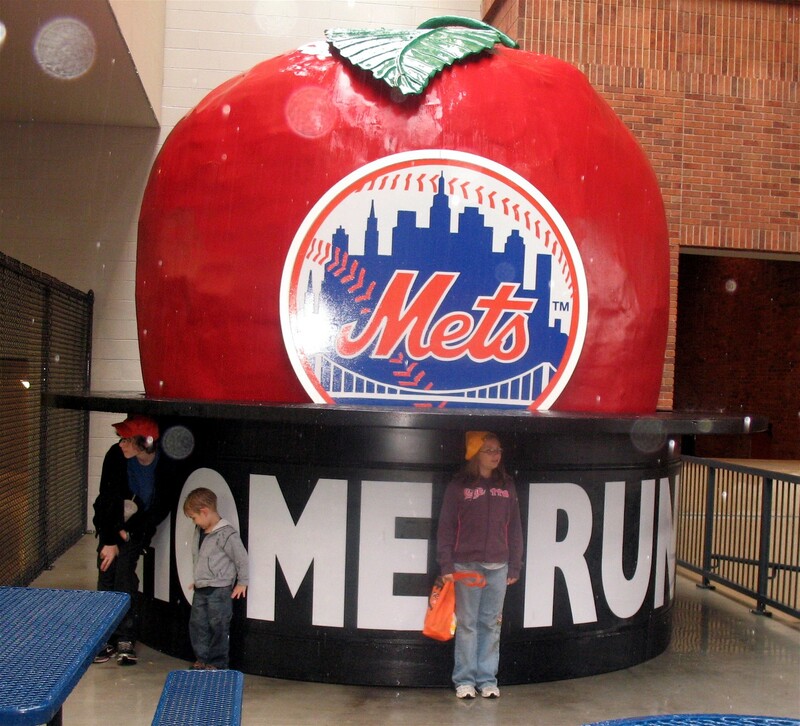 In our third game at Citi Field, I finally remembered to take a photo of the home run apple while it was “up.” This apple is much bigger than the old Shea Stadium apple and instead of being in a top hat it is just in a random raised opening in center field. Its not a bad home run apple, but I favor the old Shea apple, which seemed to have more of a *kitsch* factor. 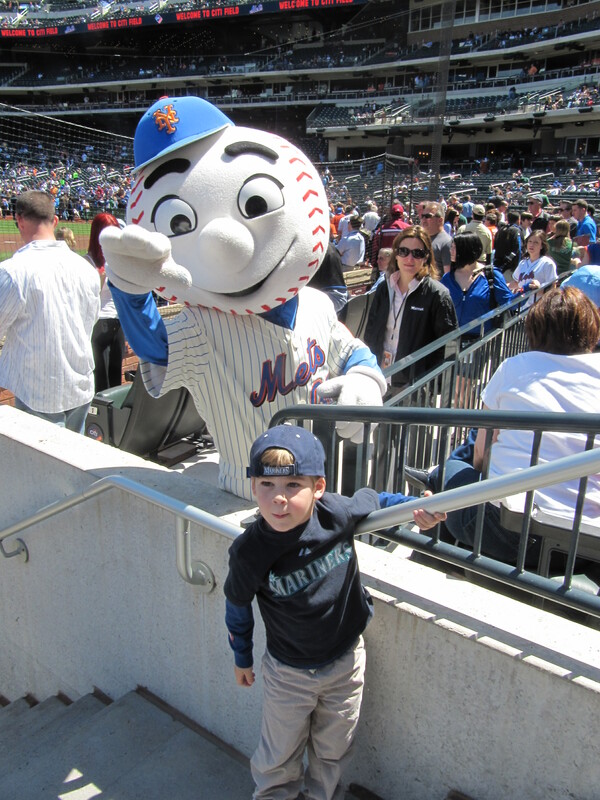 …we’d seen Mr. Met in the OF last season but never got Tim’s picture with him. So it was cool to get another chance. 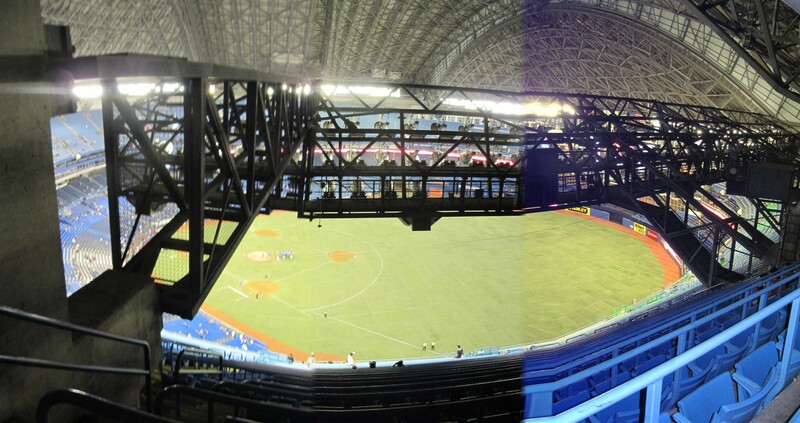 …they reminded me of some seats we visited at Rogers Centre last season. 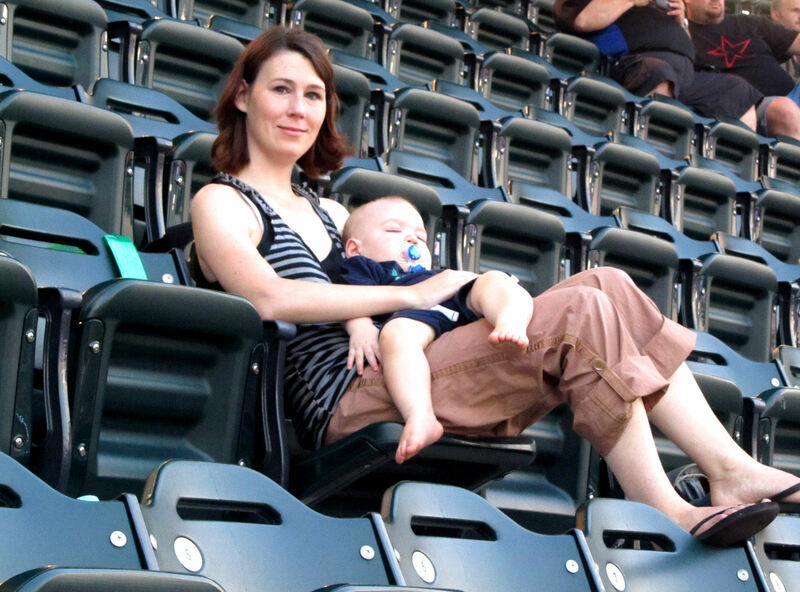 I decided we’d have to check out those seats during the game. 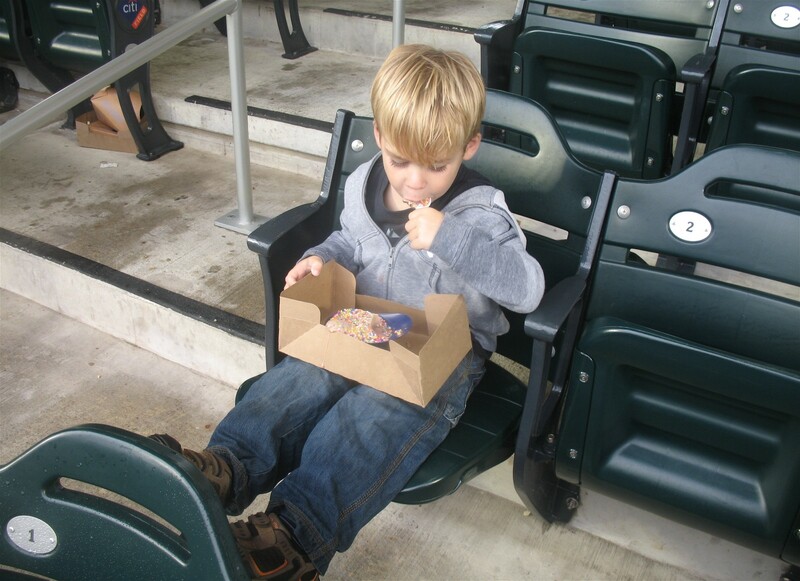 …see the little bit of dust on the corner of the dugout, those are Tim’s peanut shells. He was trying to crack them on the cement because his fingers weren’t strong enough to crack them on his own. 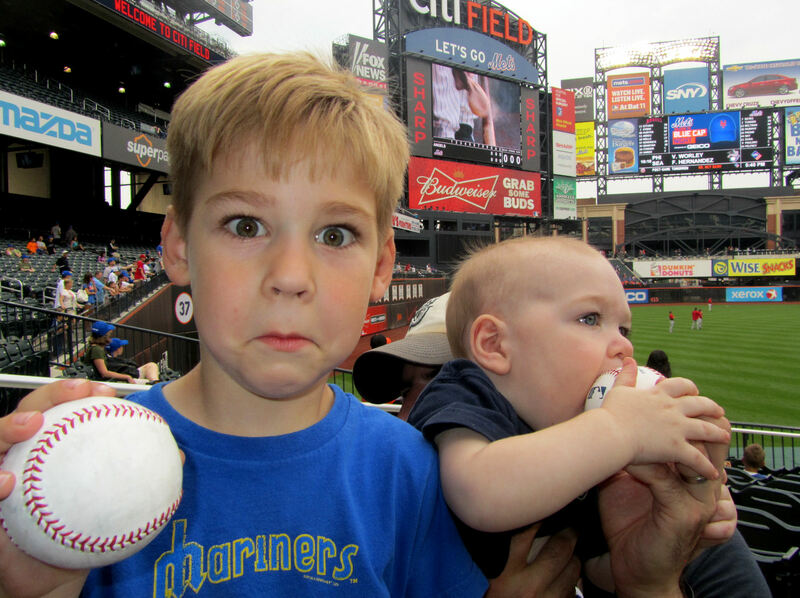 …Alex came away with that baseball in Heyward’s glove. 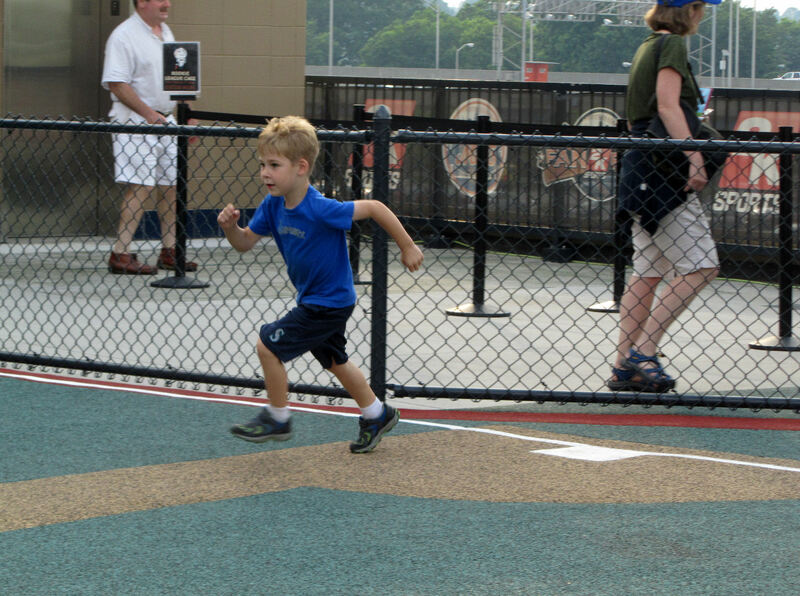 As the game started, we split away from Joe and Alex and headed toward the kids play area in center field. 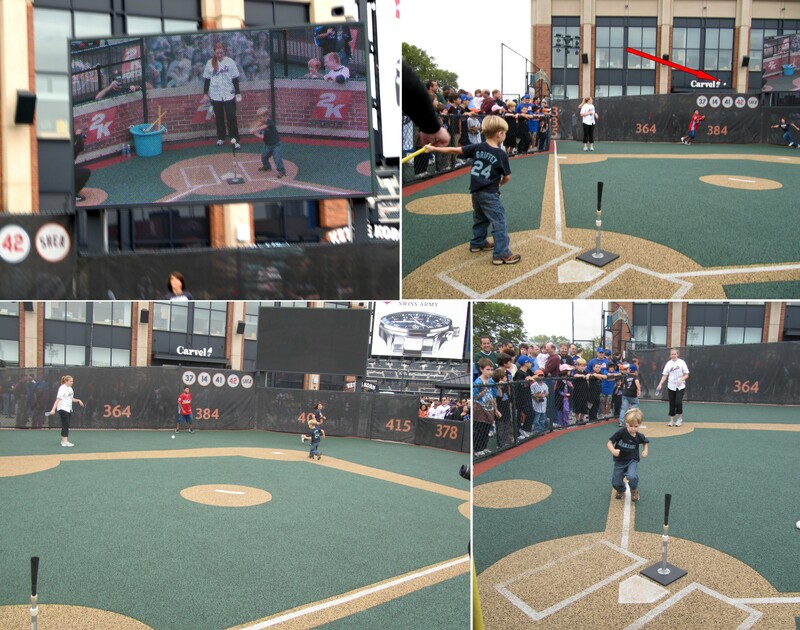 The Mets have batting cages and a whiffle ball field in CF, but not a playset like at many stadiums. Tim was excited to do some hitting. 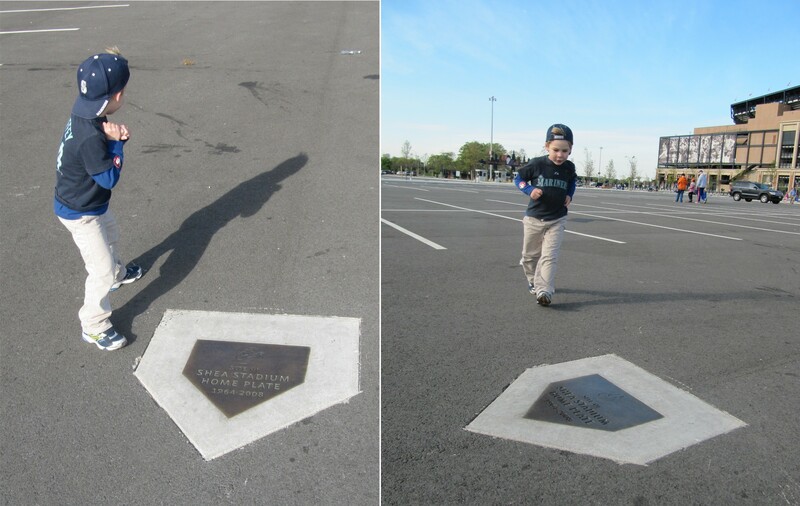 But on the way out to the whiffle ball field, he asked, “Why isn’t Alex coming to watch me hit?” It was pretty funny. I think he remembered that last season, Alex did just that. 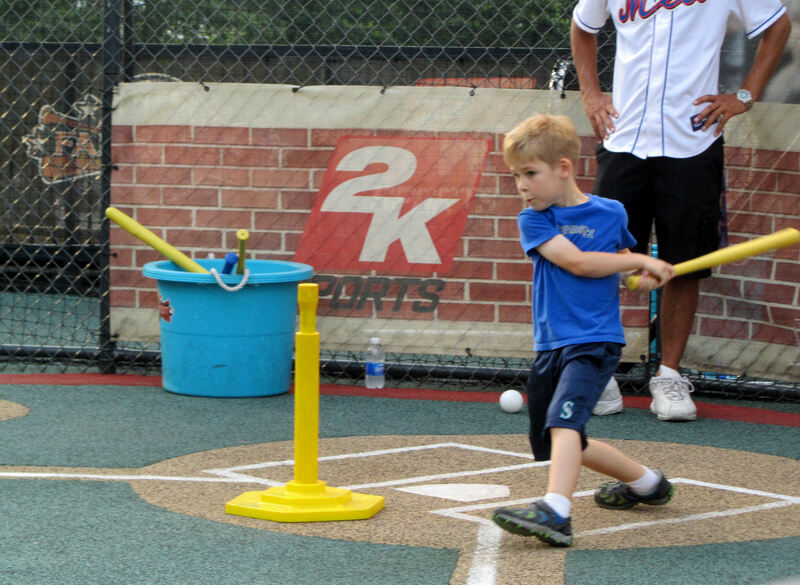 …that bat is still way too heavy for Tim, but he had fun hitting in the cage nonetheless. 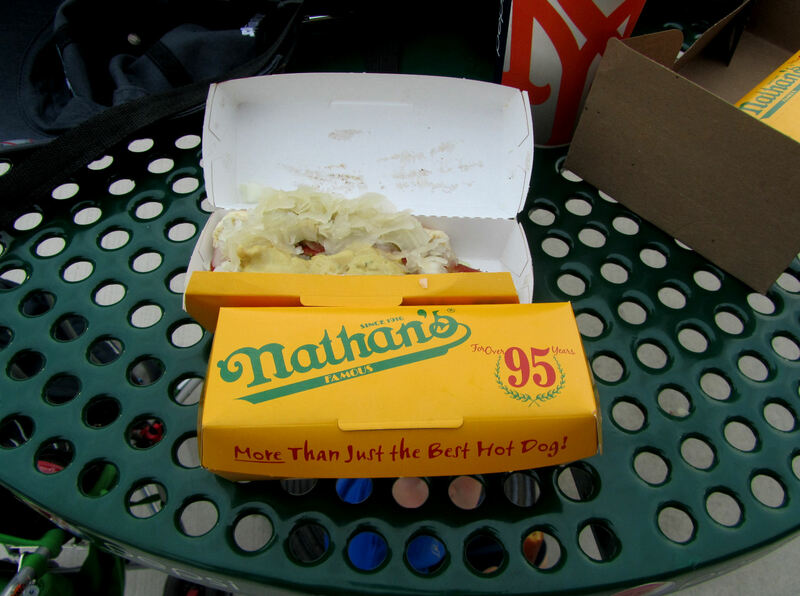 ….before I could clean the cheese from my fingers and get out my camera. 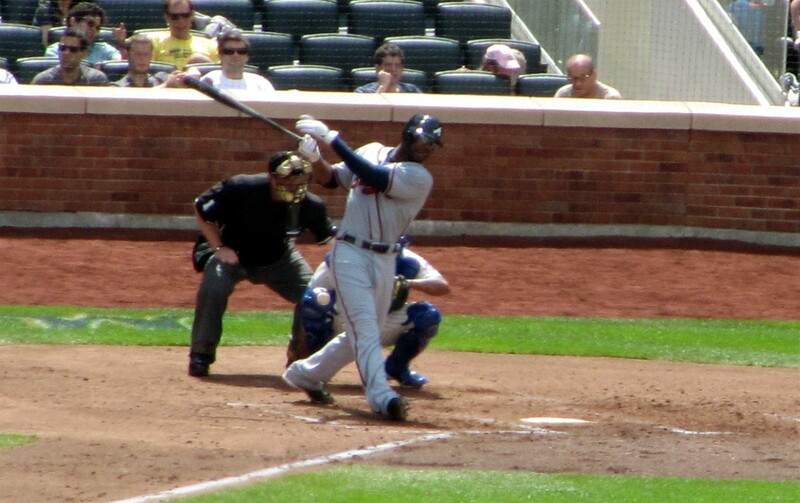 So, one Jason Heyward at-bat and one hit. Not too shabby. After the nachos, we were on the move. 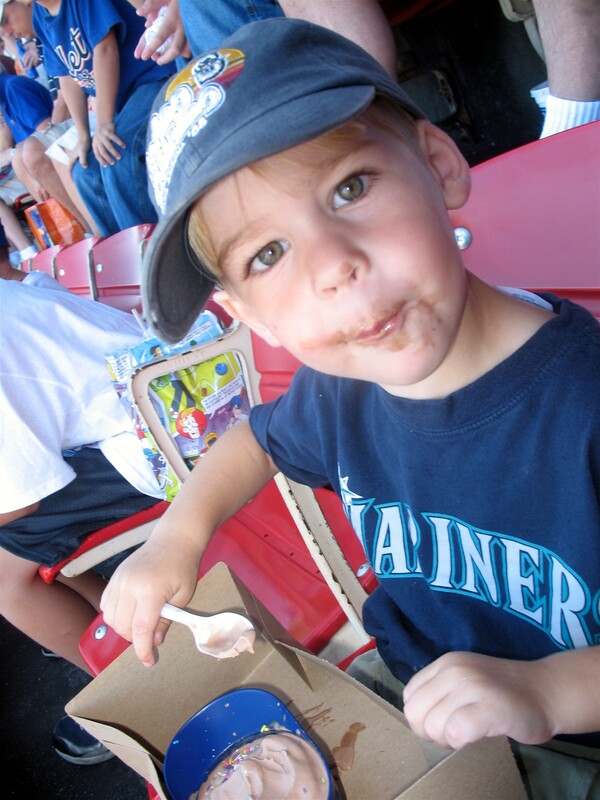 We circled the whole stadium looking for an ice cream helmet. We must have missed them because we couldn’t find them for a long time. 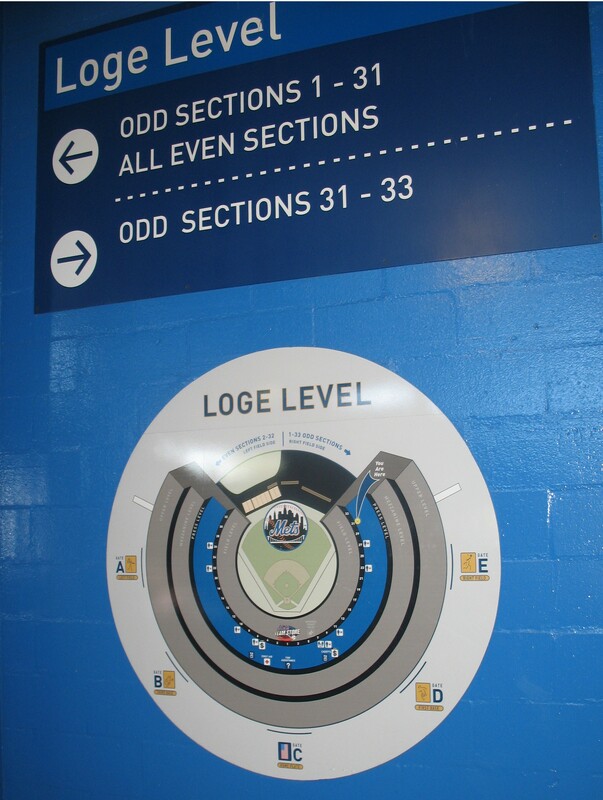 …I took this picture because that “Big Apple Brews” in the middle of the concourse wasn’t there last season. 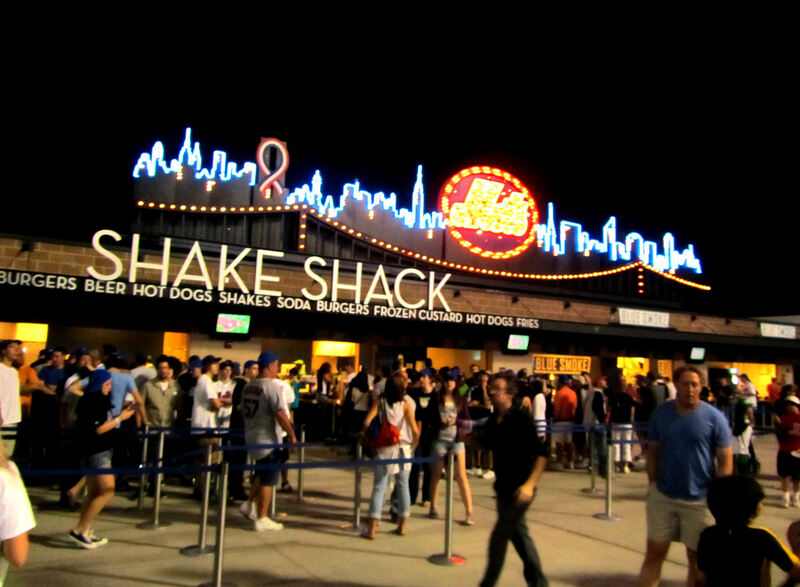 Its a new addition this season, one of several at Citi Field. We finally found ice cream in CF. 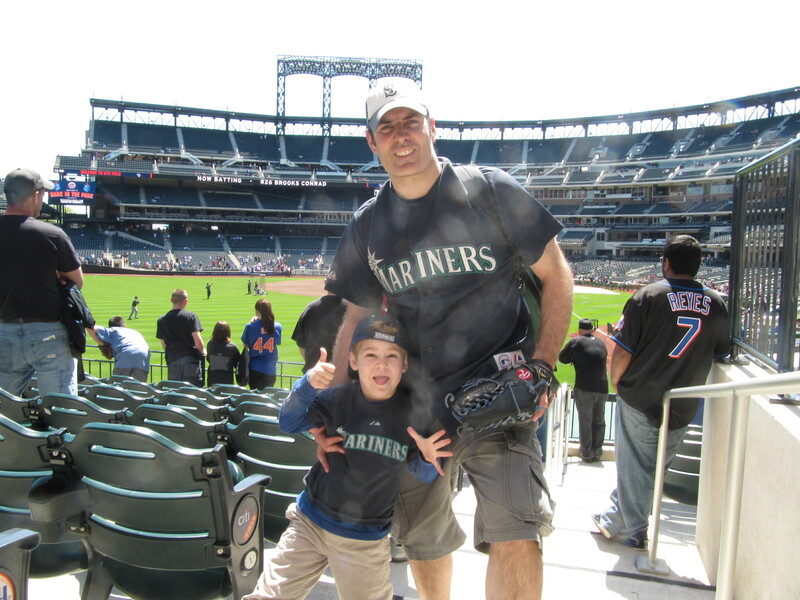 It was packed and we didn’t want to find a place in the sun, we went down under “Shea Bridge” and Tim at his ice cream behind the bullpens. 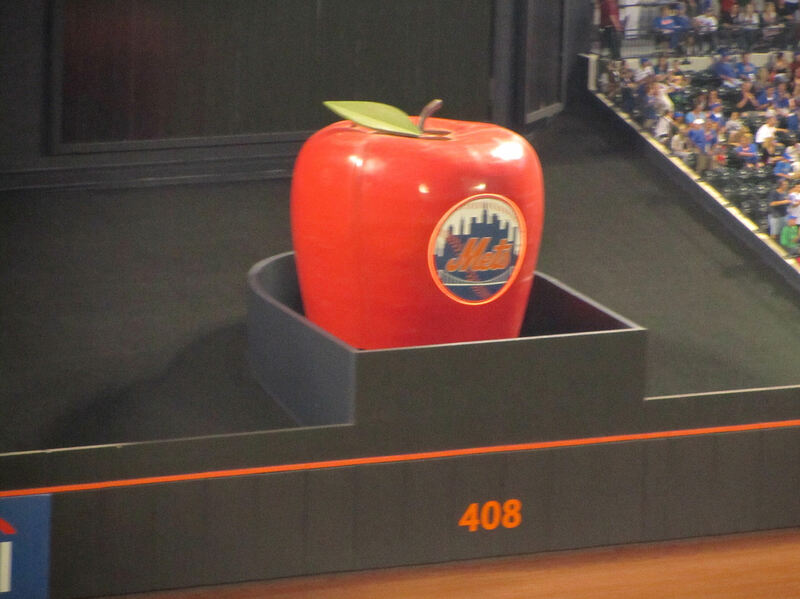 By the way, last season, the Shea Stadium Home Run apple was stationed right where this table now sits under Shea Bridge. 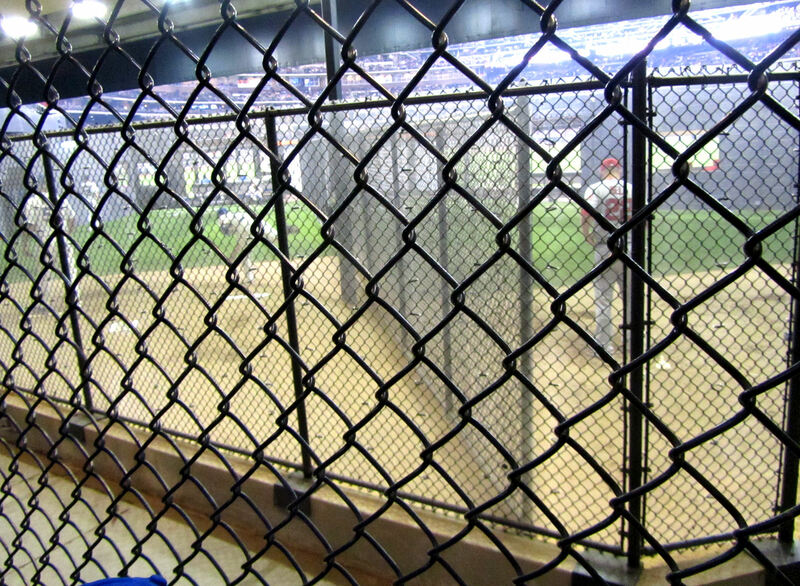 You can *sorta* see the field from behind the bullpens. 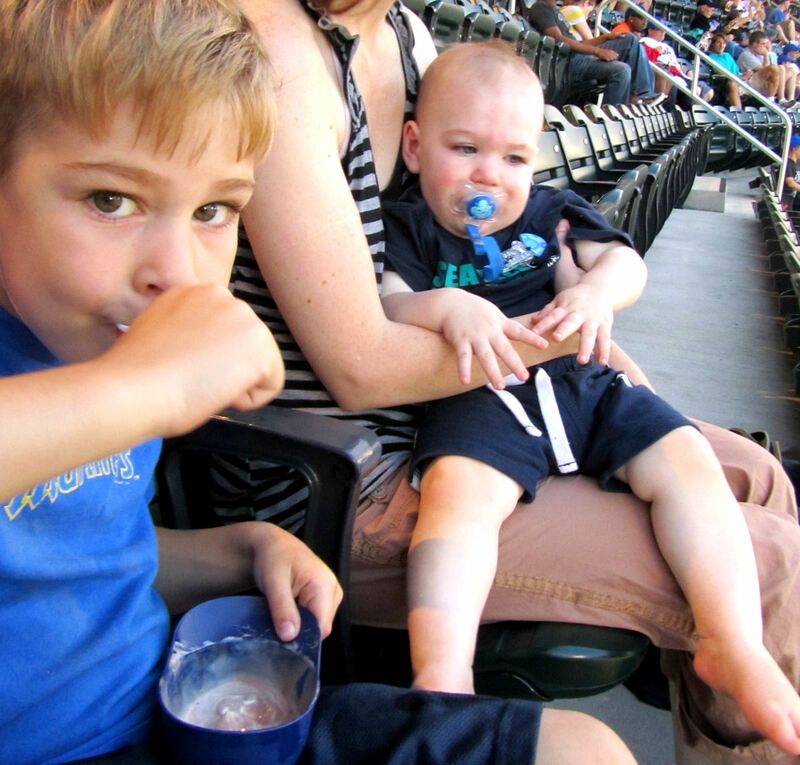 But there are a couple flat screen TVs on the wall right above the bullpens so we could watch the game while Tim ate his ice cream. 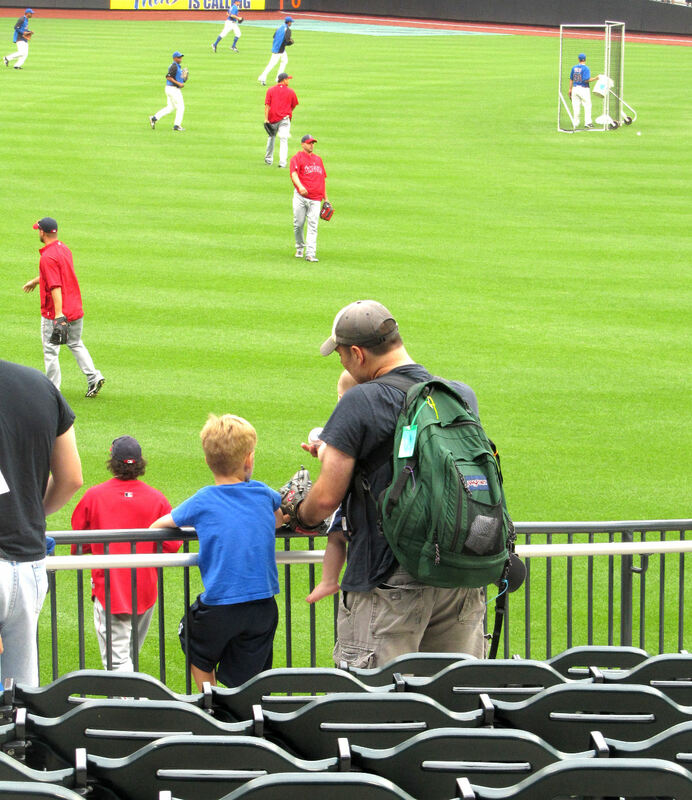 We also watched the Braves relief pitchers do some stretching. 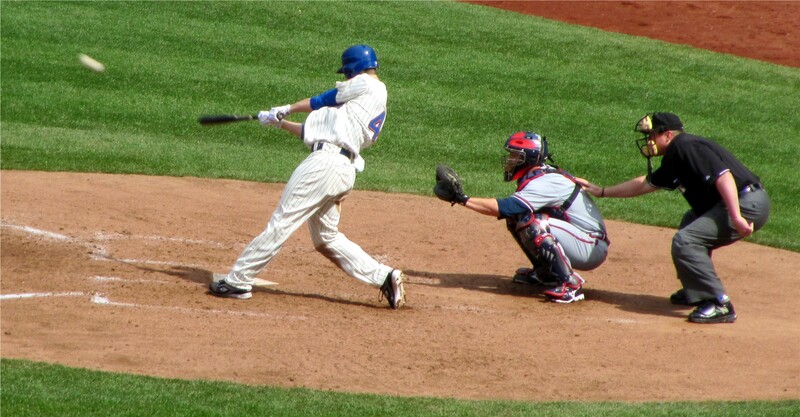 …so we ran up the stairs and snapped this picture from Shea Bridge of Heyward fouling a pitch straight back (its right on the catcher’s right knee). 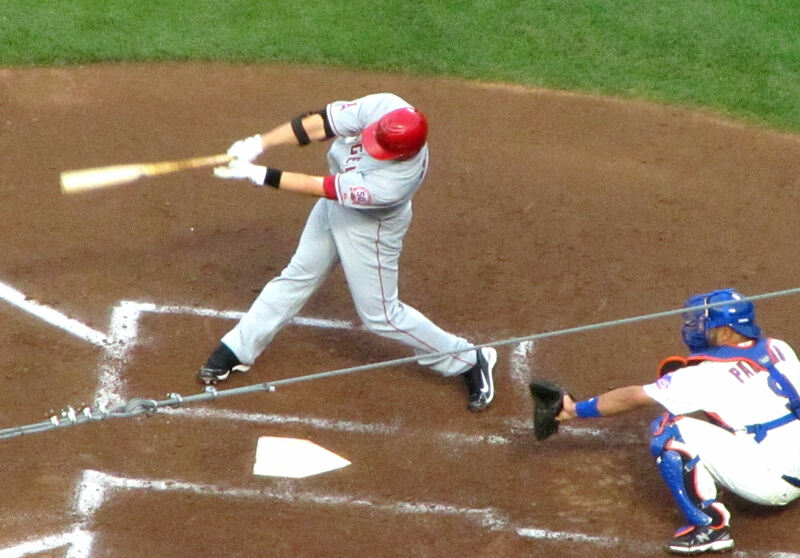 He eventually struck out in this at-bat. 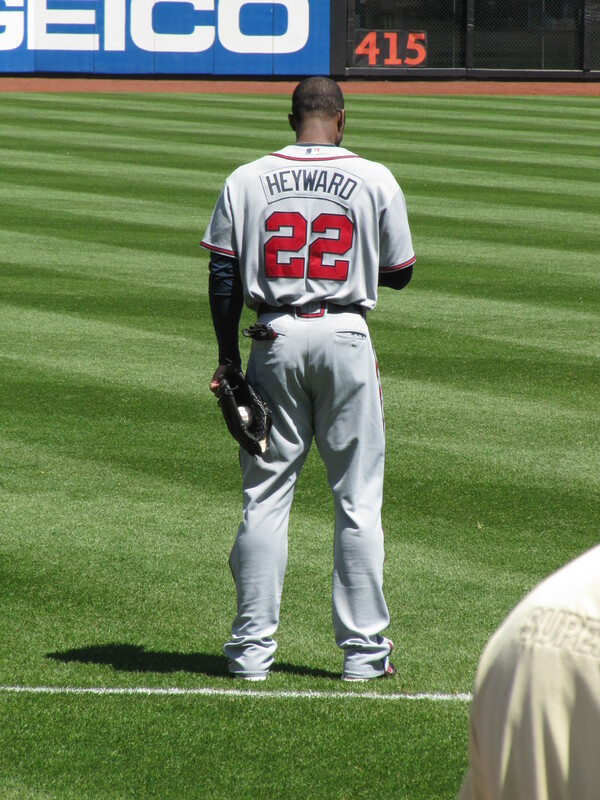 ….by the way, according to baseball-reference.com, Jason Heyward is 6′ 5″ and Braves first base coach Glenn Hubbard is 5′ 9″. After watching Heyward walk, we decided to check out another new feature at Citi FIeld, the Mets Hall of Fame in the Jackie Robinson Rotunda. 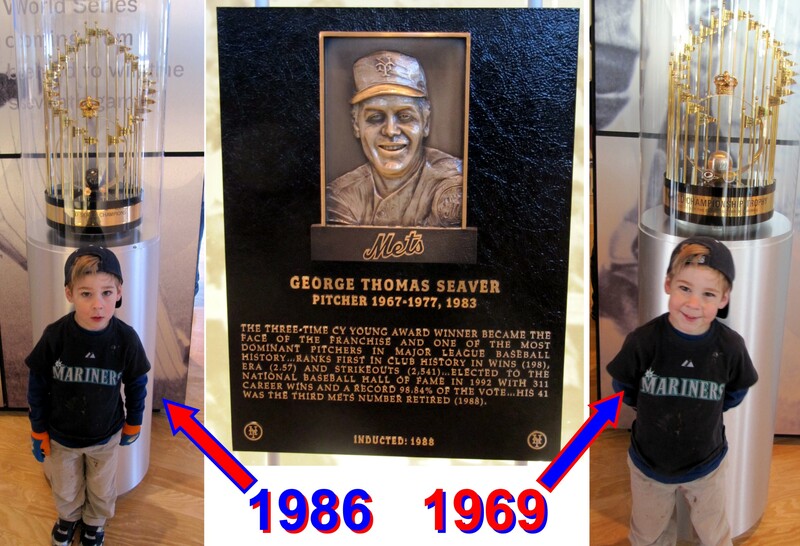 ….it was cool to see the 1986 trophy because it was the first World Series that I really followed as a kid. 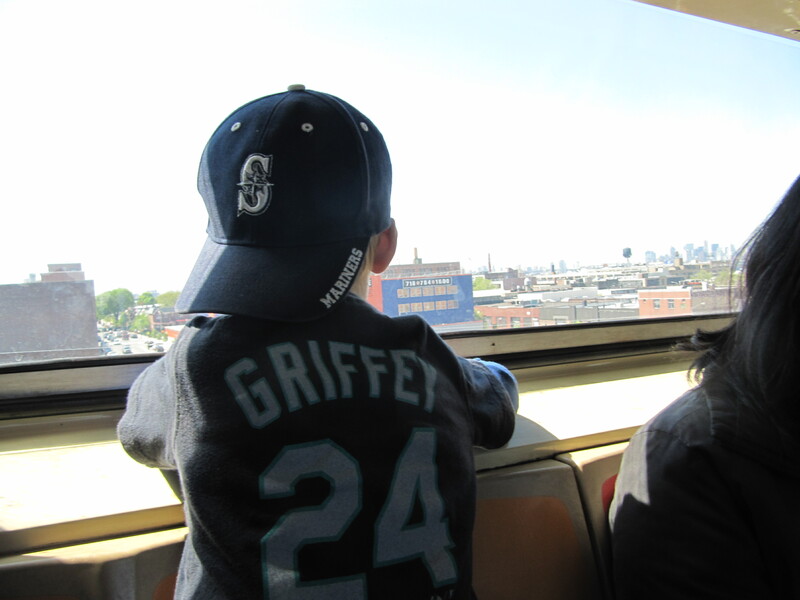 However, I was rooting for the Red Sox who had traded during the 1986 season for two Mariners, Dave Henderson and my at-the-time favorite player, Spike Owen. 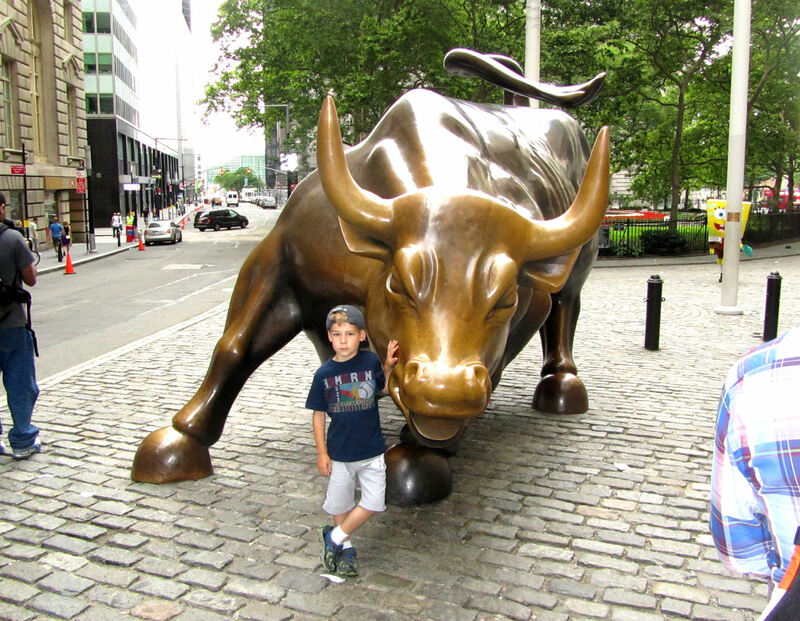 …that’s a great little statute. 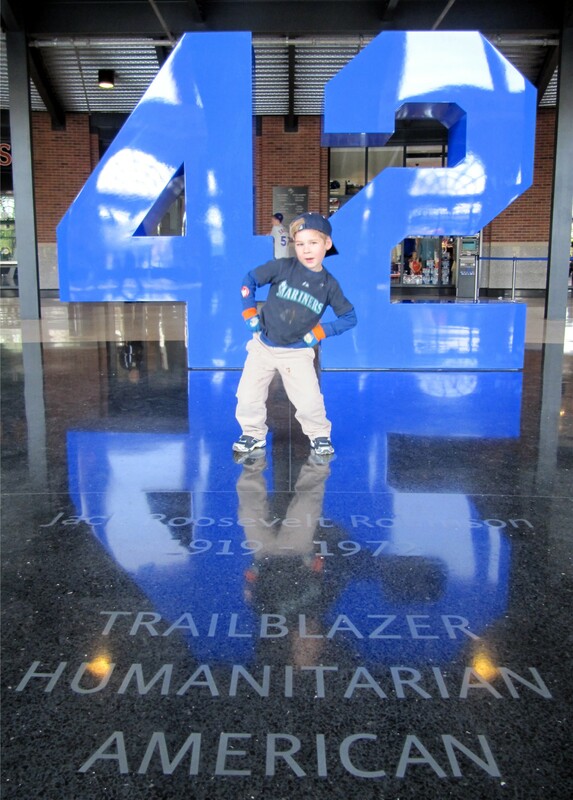 …standing in Jackie Robinson’s foot steps. 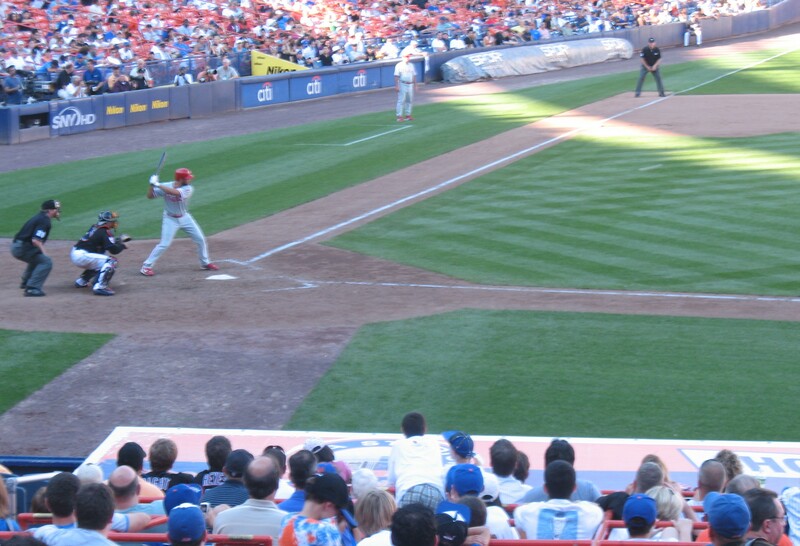 …scoring Jose Reyes and tying up the game at 1-1. 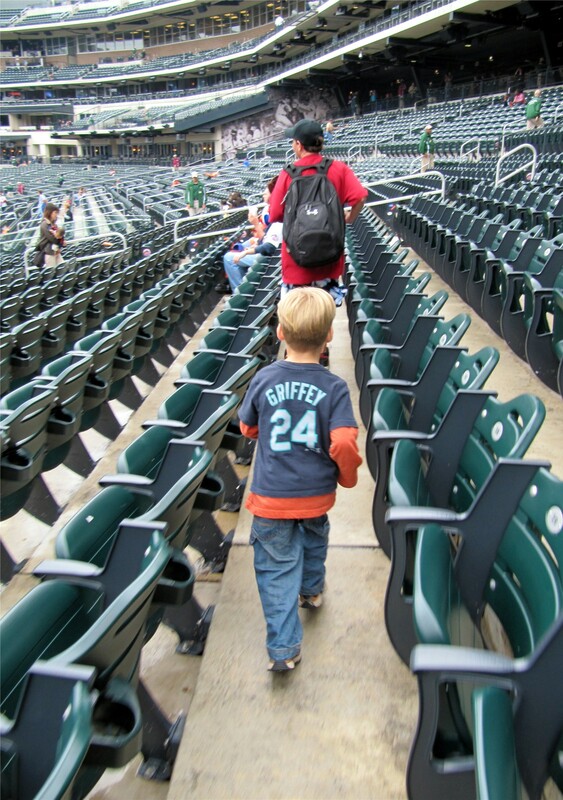 In the seventh inning, Walla Walla Washington’s own (and former Mariner) Eric O’Flaherty entered the game for the Braves…. 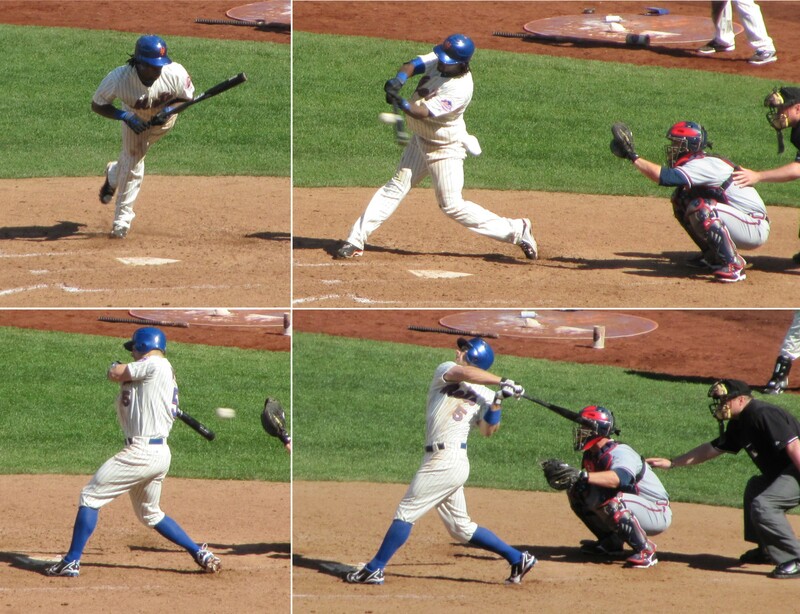 ….he only faced one batter and probably threw over to first as many times as he threw to the plate. Eventually, he retired his only batter of the day, Alex Cora. 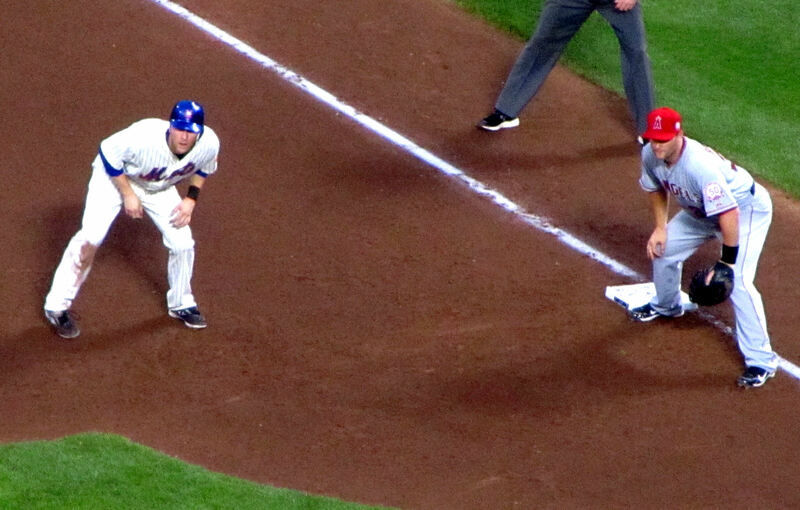 …but he beat the throw to first. 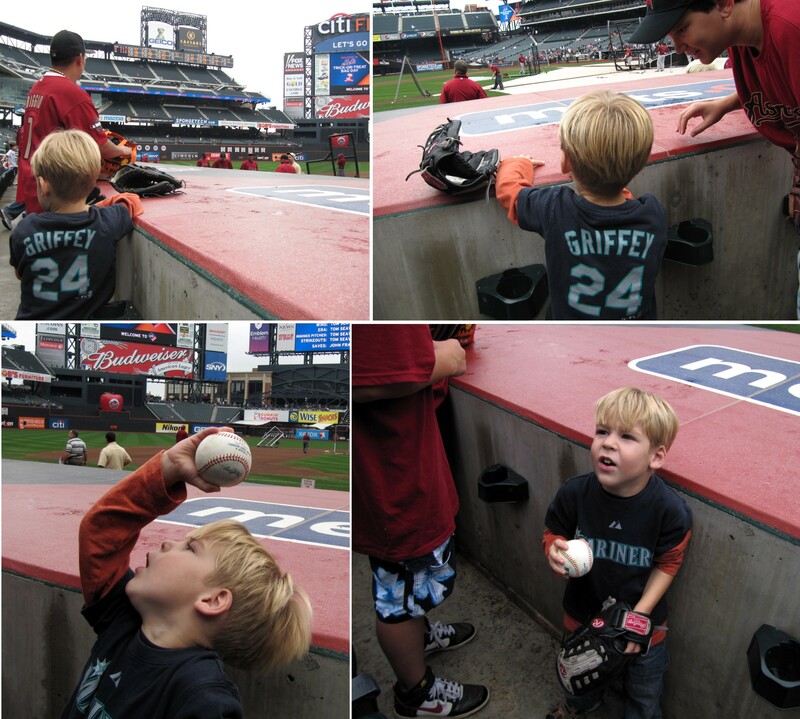 We didn’t manage to catch a ball during BP. So we were hoping we would get a chance for an umpire ball after the final out of the game. 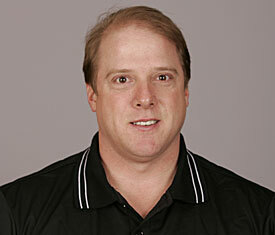 The home plate umpire was Bruce Dreckman. 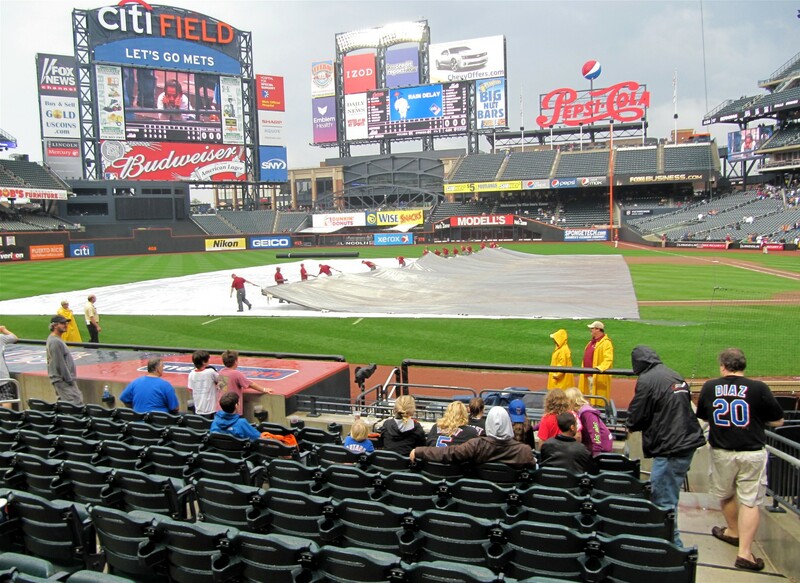 The only problem is that the Mets ushers religiously check the tickets of all patrons entering the field level seats during the entire game. 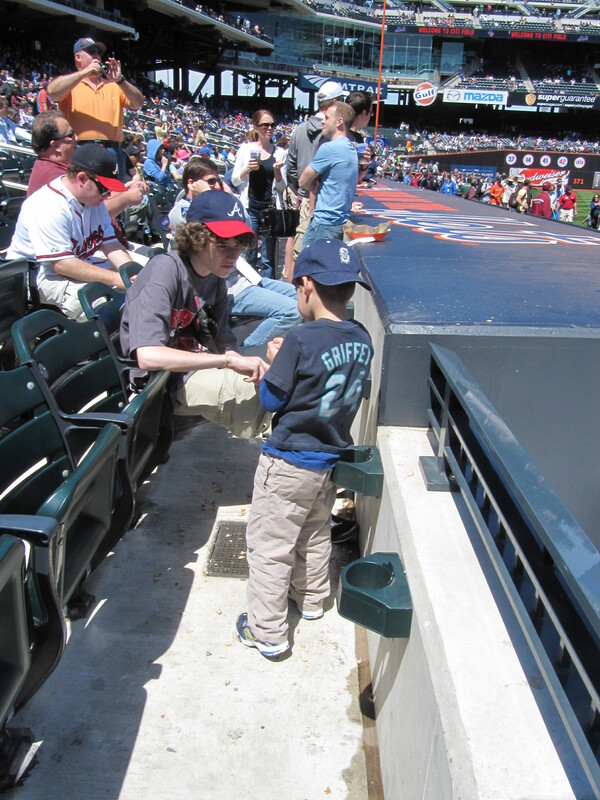 When it got to the top of the ninth inning (with the home team winning) and they were still checking tickets, I figured it just wasn’t in the cards for this game, which was fine because we’d had a great day at the ballpark already. 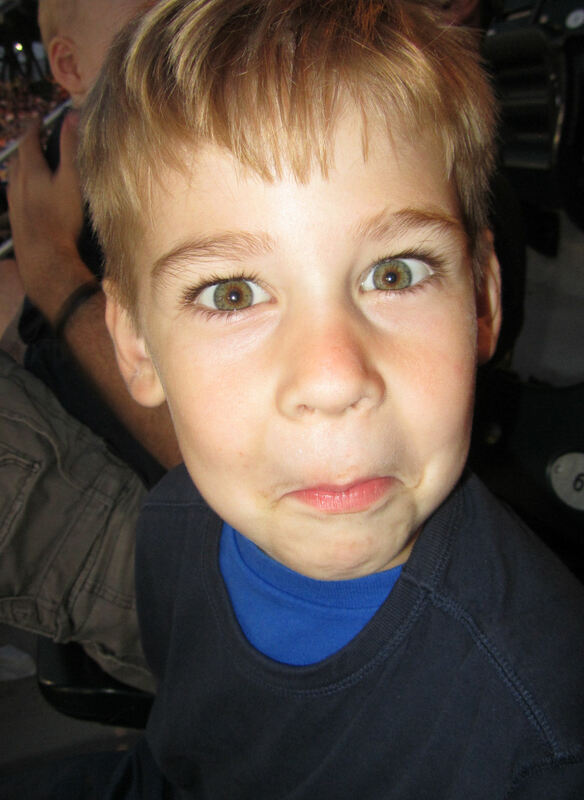 But then something funny happened, with one out in the top of the ninth, Alex came walking up the stairs to the concourse. 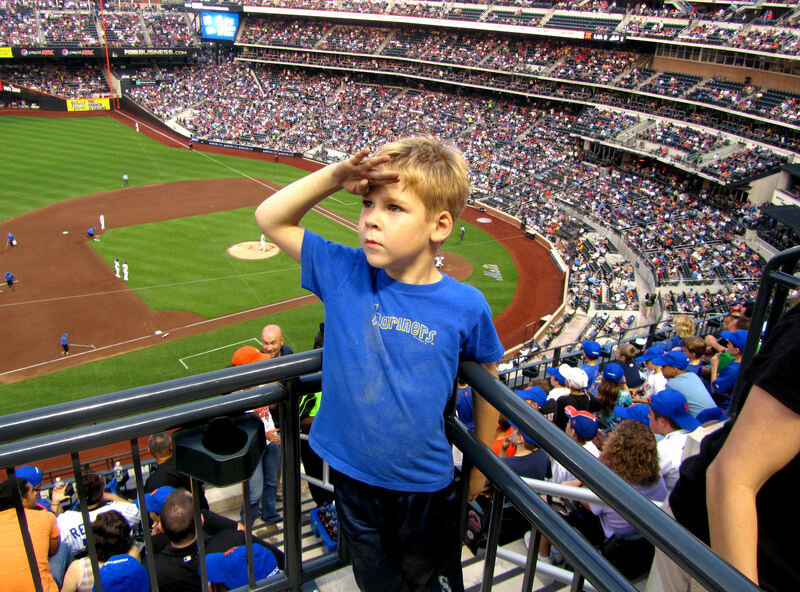 He was looking for us and he was armed with a field level ticket for a section right by the umpires tunnel. He flashed his ticket for the usher and we were all admitted to the seats with one out to go in the game. 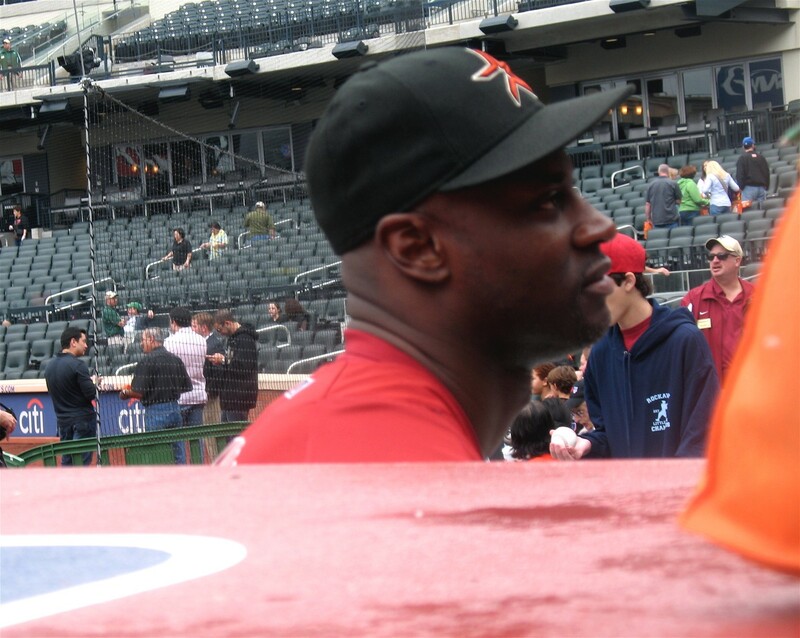 We met up with Joe just a short distance from the umpires tunnel. We had just enough time to say hi to Joe when Martin Prado (in for Chipper Jones who got hurt somehow during the game) grounded out to end the game. 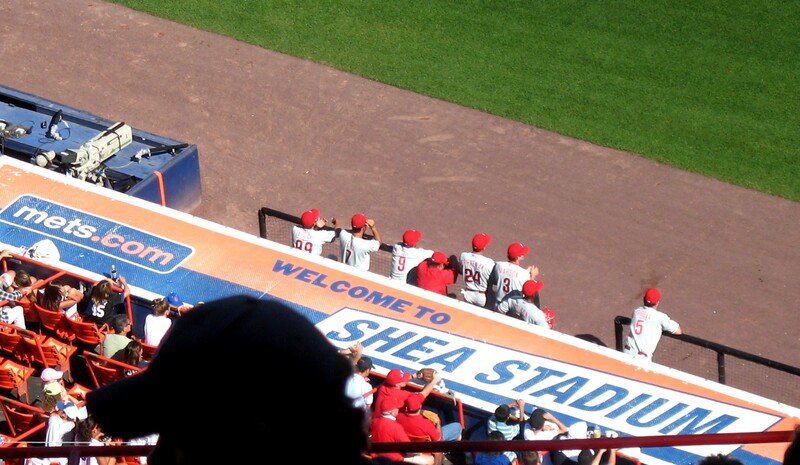 Even before the ground ball reached Jose Reyes, we were standing next to the umpires tunnel. Tim called out to “Bruce!! 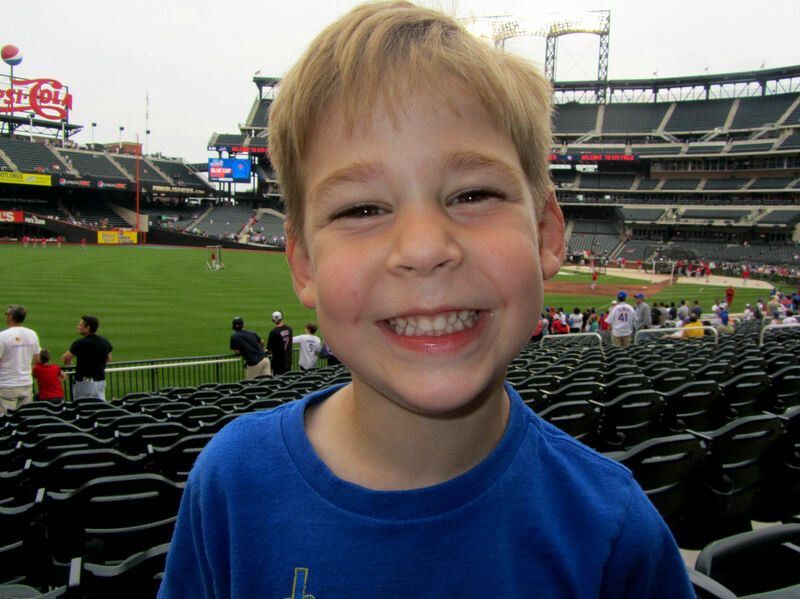 !” as he exited the field. 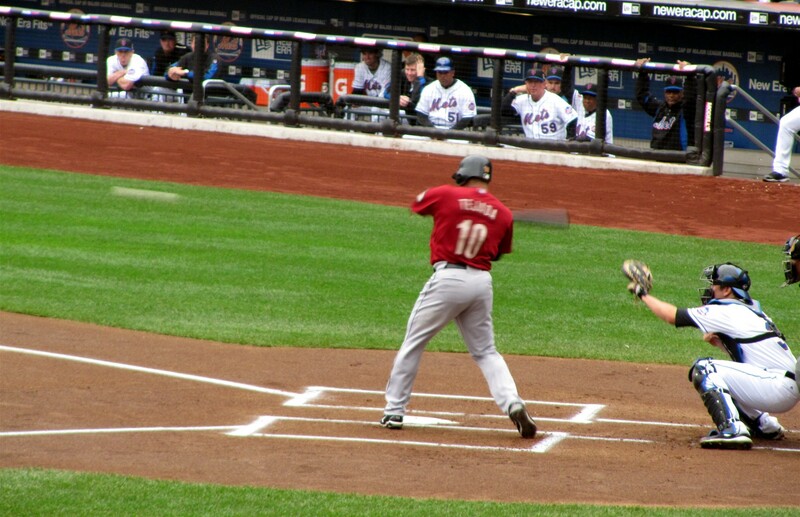 Dreckman reached out and set a nice rubbed up gamer into Tim’s left “Go, Deigo, Go!” glove-clad hand (as shown above, Tim likes to wear these gloves at games because he thinks they are like batting gloves). However, with the thick and slick glove on his hand, his left hand wasn’t big enough to palm the ball and he dropped it back into the tunnel. Luckily, another umpire (I think Paul Emmel) saw the whole thing unfold and he picked it up and handed it back to Tim. Thanks, Mr. Dreckman and (probably) Mr. Emmel! And thanks, Alex, for the assist! 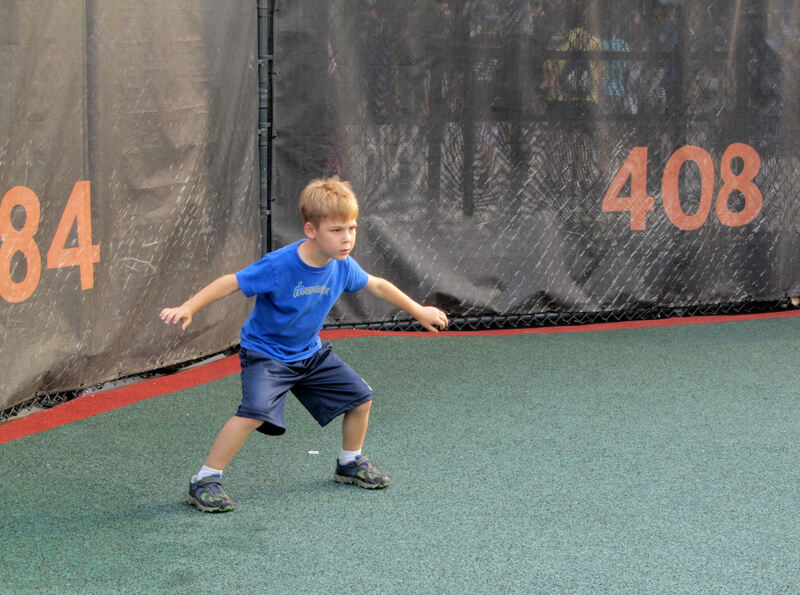 (Check out his serious face as he balances the ball on his head). 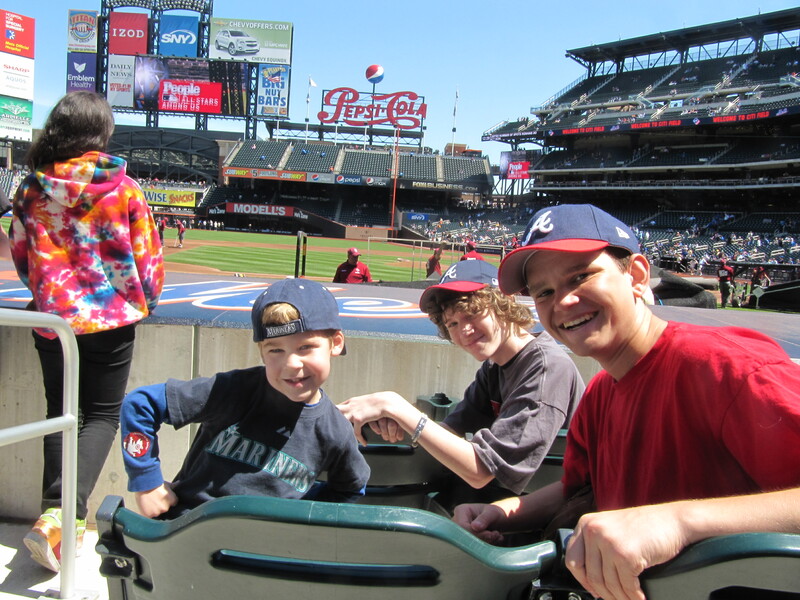 We hung out with Joe and Alex for a few more minutes behind the dugout before getting in line for Kids Run the Bases. Tim was excited to chat up his guys a little more. 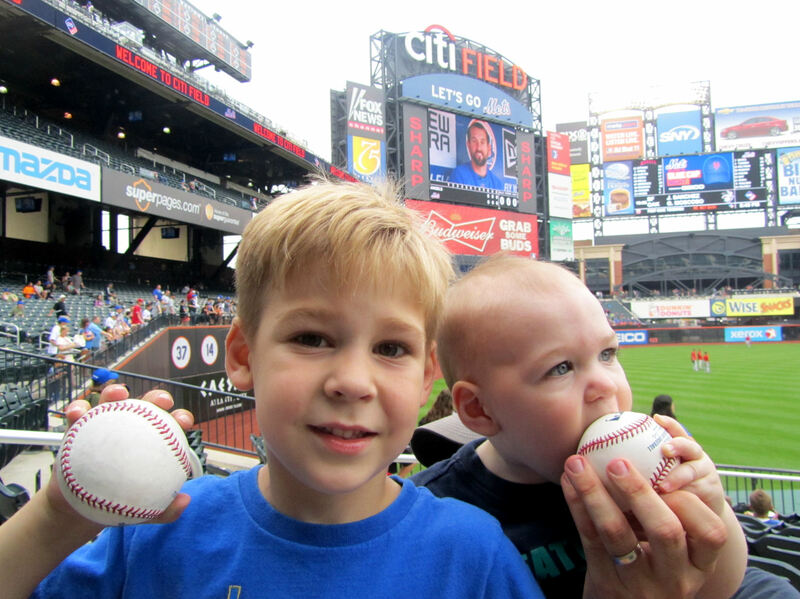 Joe helped him hold the ball steady and he wrote a shaky but legible “T-I-M” on the ball. 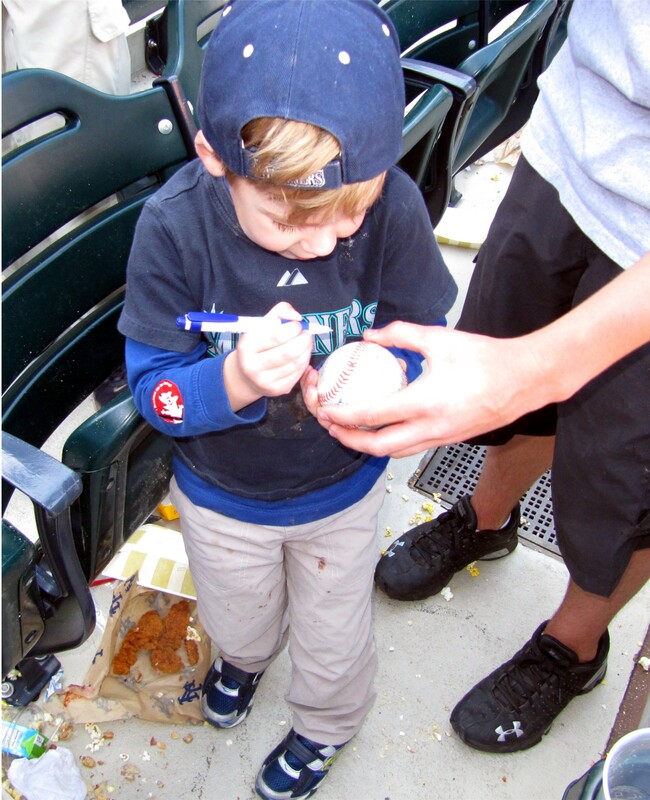 Then for good measure (at the request of the ball’s owner), he did a little scribble next to his “signture.” Tim got a kick out of the experience. 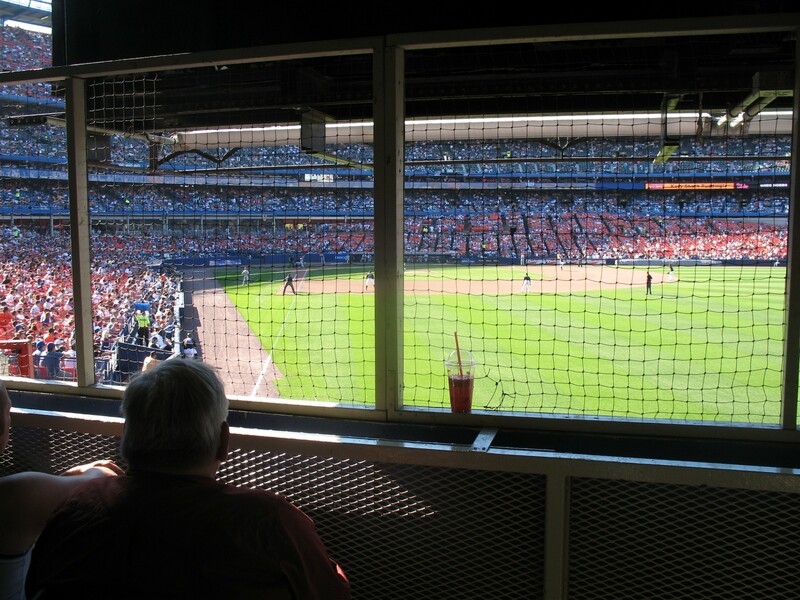 To the left, that is the Moe’s Club right behind the RF wall. There is a restaurant (at least it looked like one) behind this seating area. 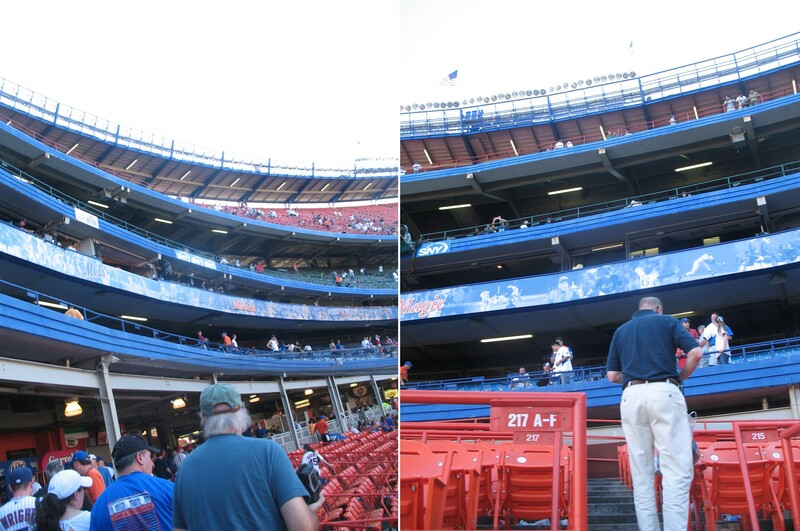 To the right, that is the little room where the relief pitchers sit in the Mets bullpen. 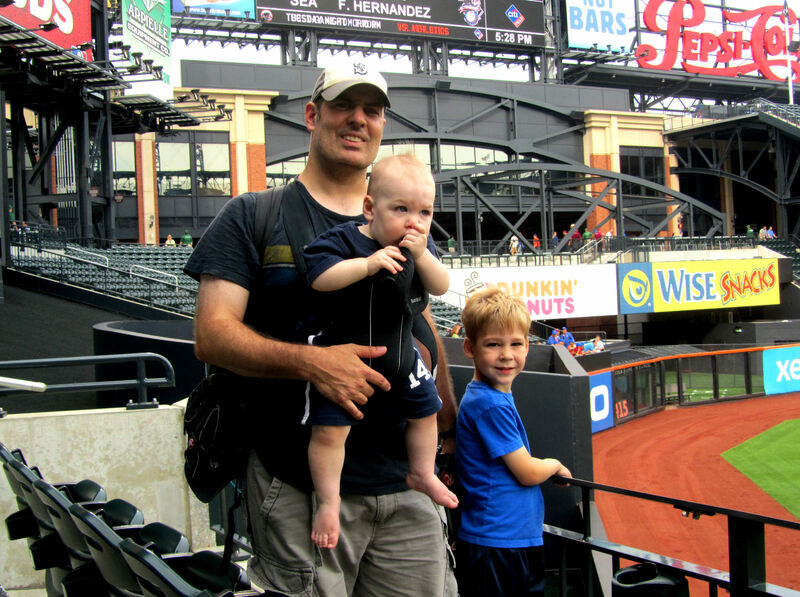 I also enjoy it when I am allowed to “chaperone” Tim around the bases — something I have now been allowed to do at Citi Field, Rogers Centre, Miller Park and Progressive Field. 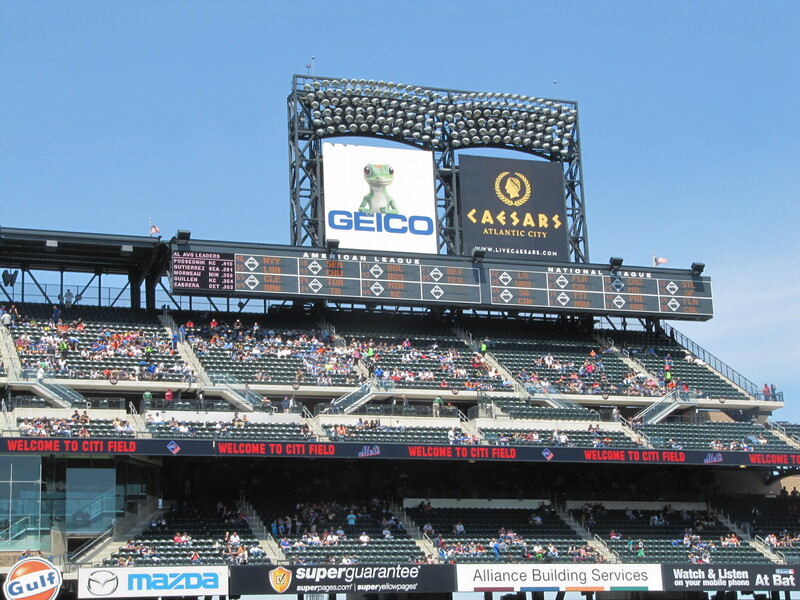 Although we attended a game in 2008 when Shea and Citi were right next to each other, I was still amazed at how close the Shea Stadium base placques were to Citi Field. …and called it a day. We hopped the 7-train back to Manhattan, picked up some pepperoni pizza and garlic knots, and drove home. 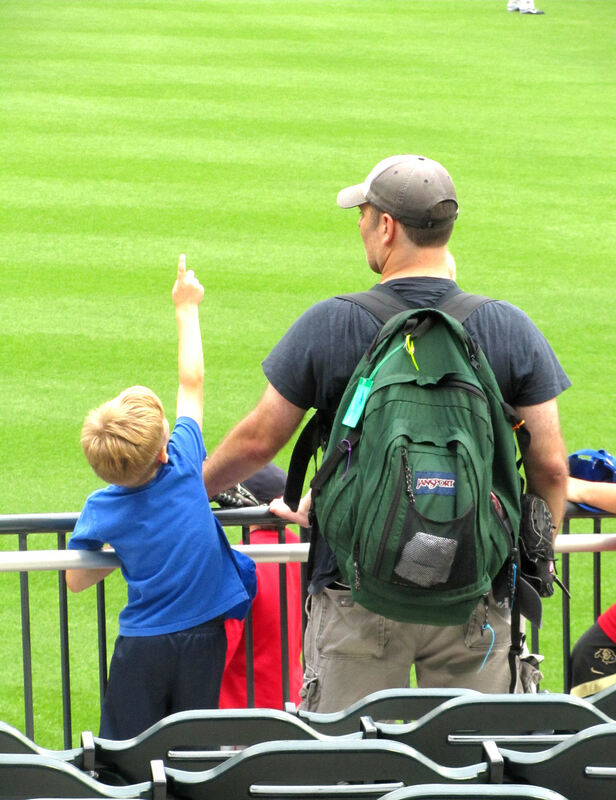 After leaving the house at 8:00 a.m. in the morning, we arrived home at about 9:00 p.m….thirteen hours well spent on another father-son baseball adventure. Over the past several months, I have slowly been planning our 2010 season. 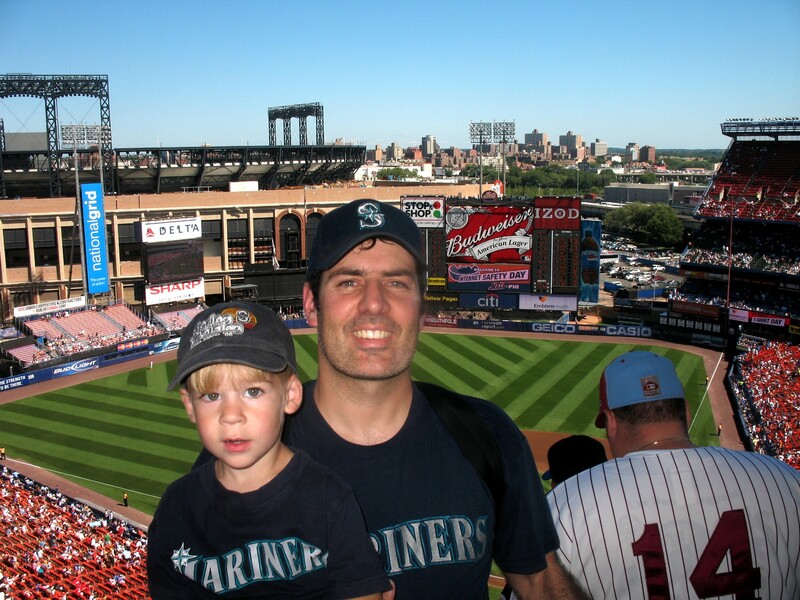 Like in 2009, Tim and I will visit 13 MLB stadiums (with an outside, but very unlikely, chance that we’ll hit a 14th stadium). I have many of our games planned out and tickets secured. Other games are tentatively planned, but still uncertain. 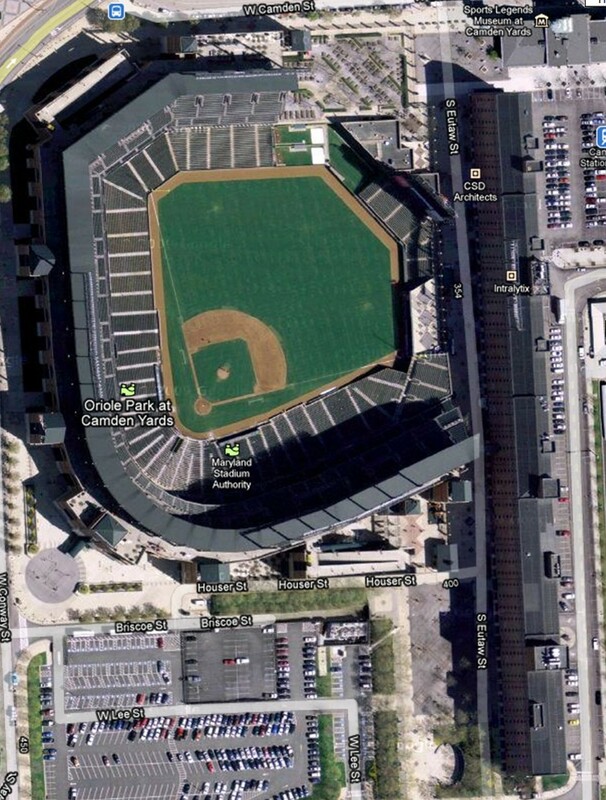 Whatever the order and whatever the actual games end up being, we will definitely make it to each of the following stadiums (as seen via Google Earth and Bing satellite views). 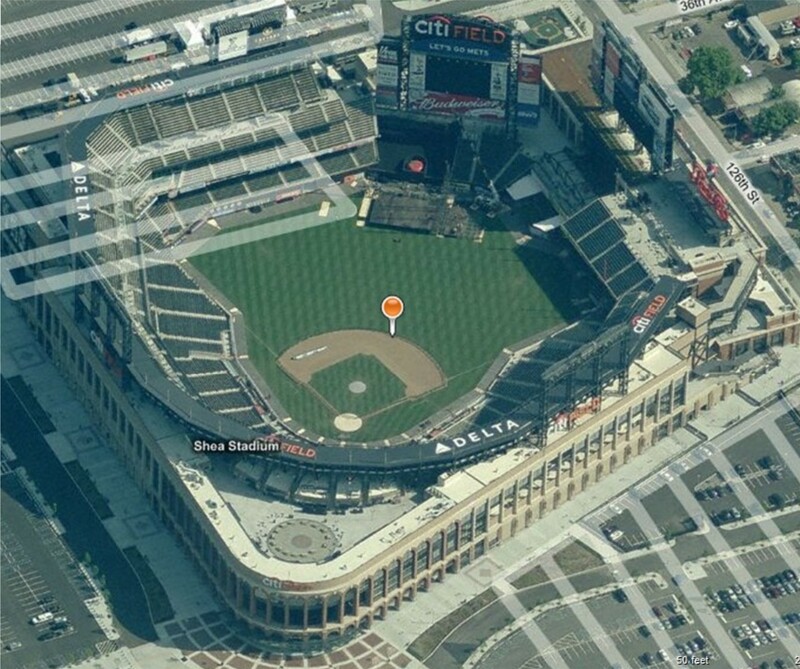 FYI, I couldn’t find any satellite views of Queens post-Shea. 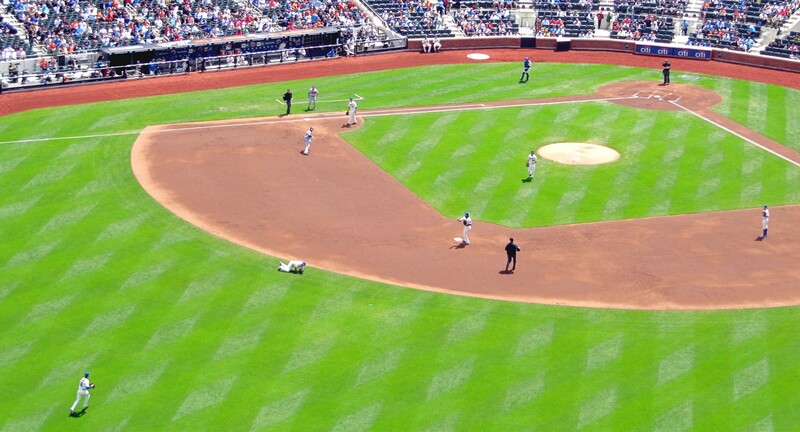 Therefore, I cut out Shea’s infield and guestimated where Citi Field’s infield now lies. 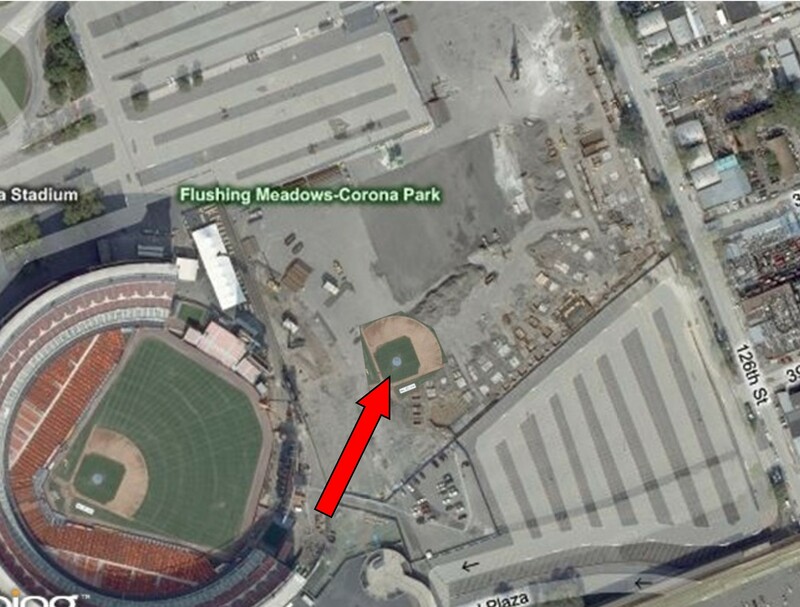 I could be totally off, but I think the Jackie Robinson Rotunda takes up a lot of space under my red arrow. 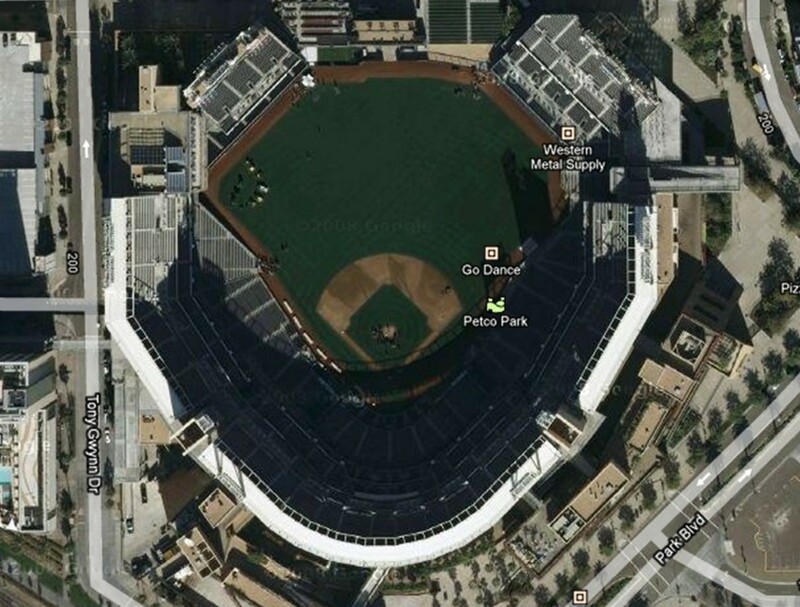 Again, I could not find a satellite view that shows the current Yankee Stadium. 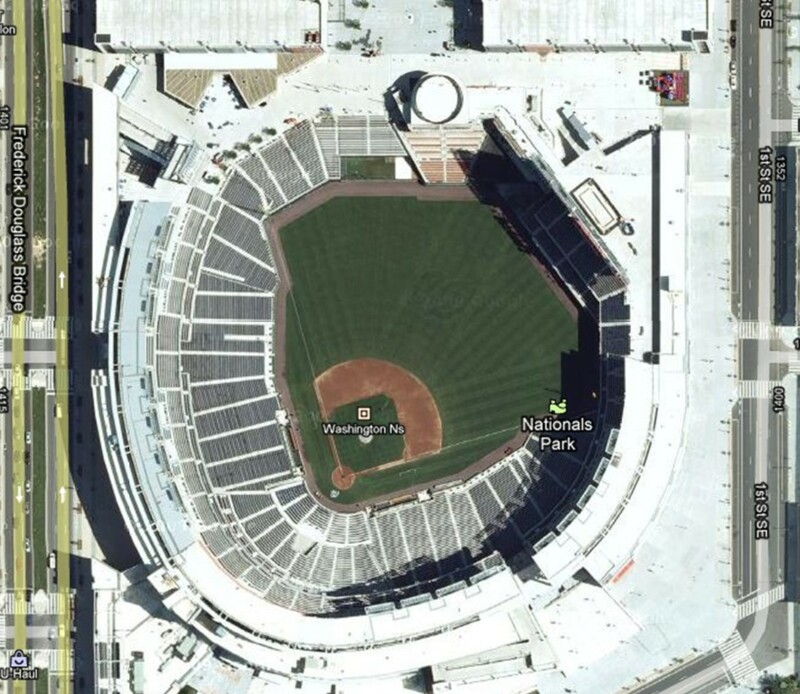 So, I cut out the infield of now demonlished 1923 version and pasted it roughly where I estimate the infield lies in the current Yankee Stadium. 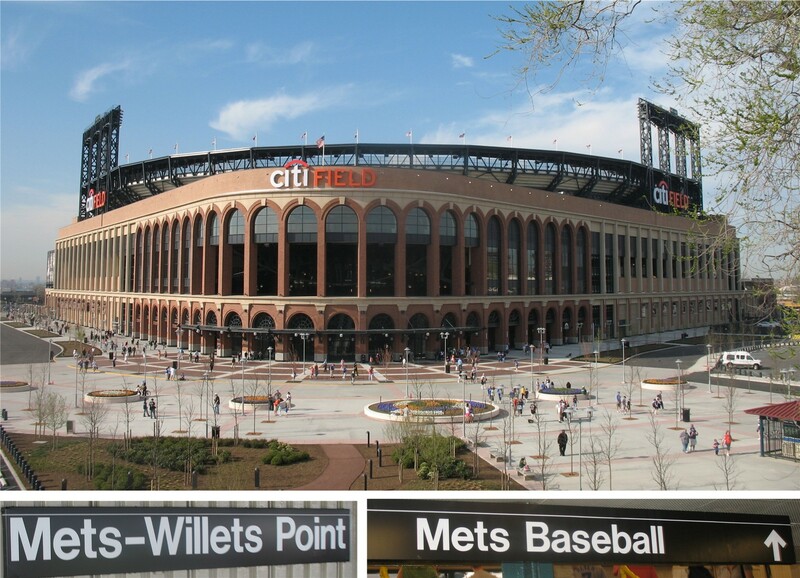 And there you have it, the stadiums that Tim and I will visit in 2010. 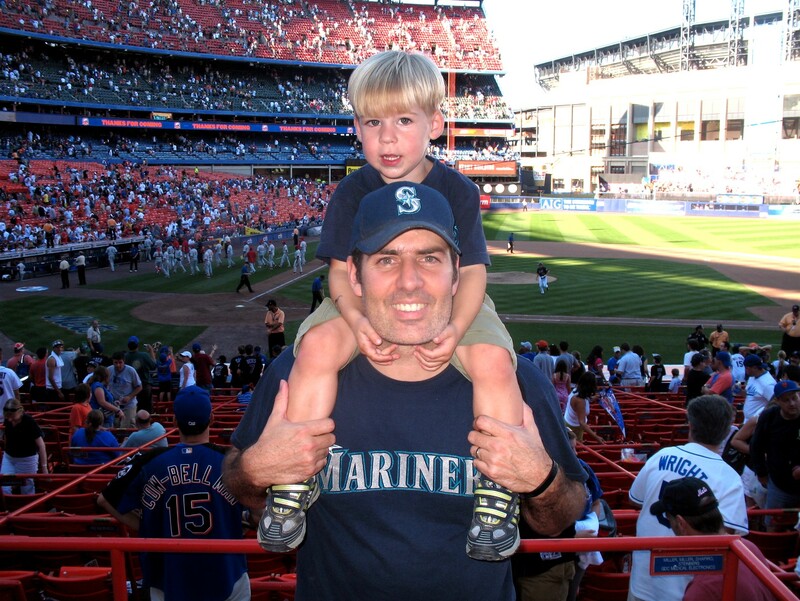 I had originally wanted to spend the 4th of July weekend in Detroit to see the Mariners play at Comerica Park. But that just isn’t going to happen…and I highly doubt we will make it to Comerica at any point this season. Maybe next year. One comment about these satellite views. 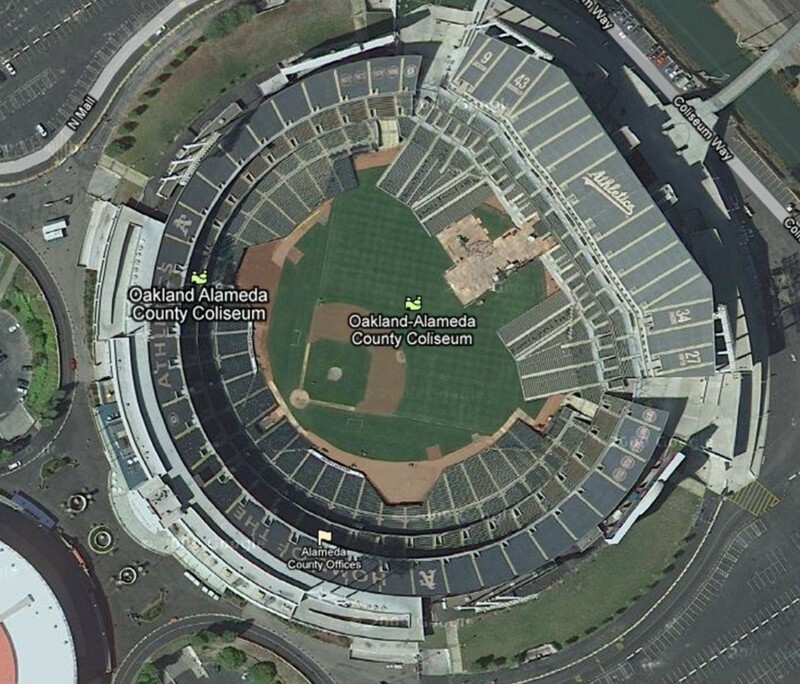 I did not rotate any of the stadiums. 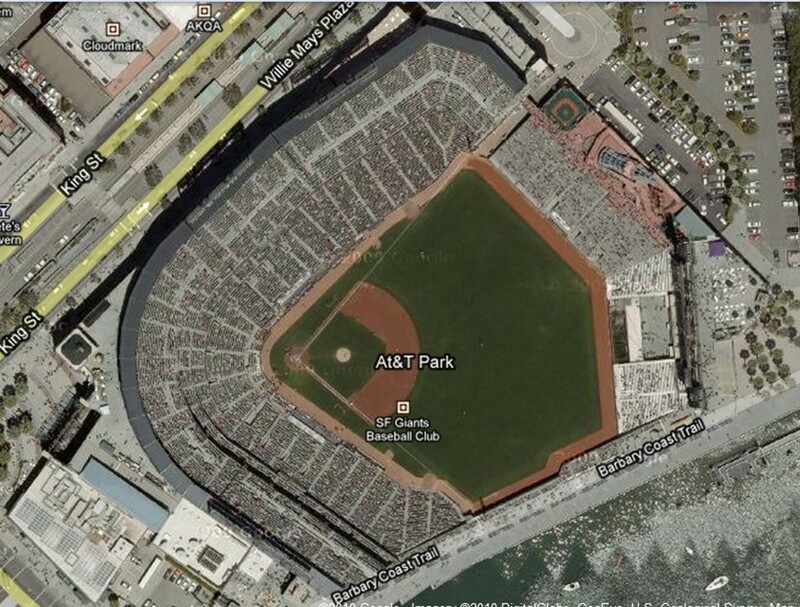 Therefore, you can see that home plate at all of these stadiums except one point to the northeast. 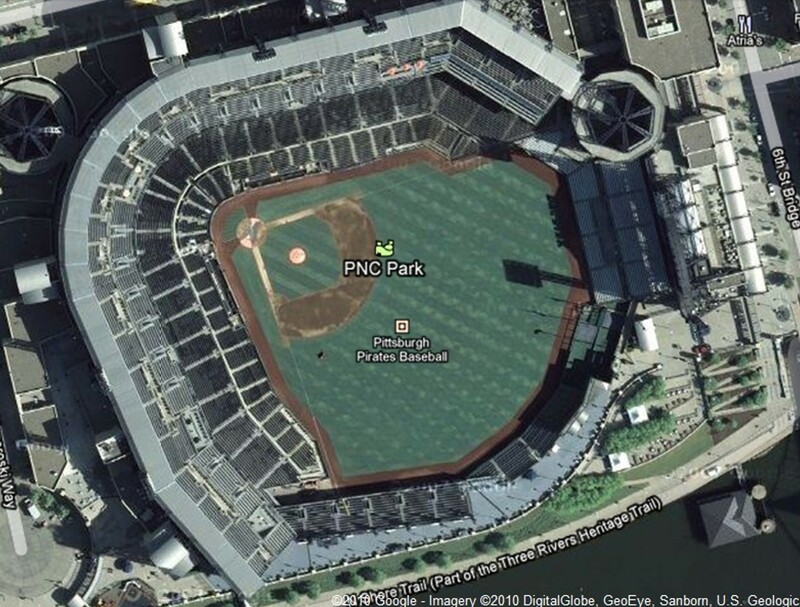 The sole exception is PNC Park which points to the southeast. I thought that was an interesting part of seeing all of these satellite views. 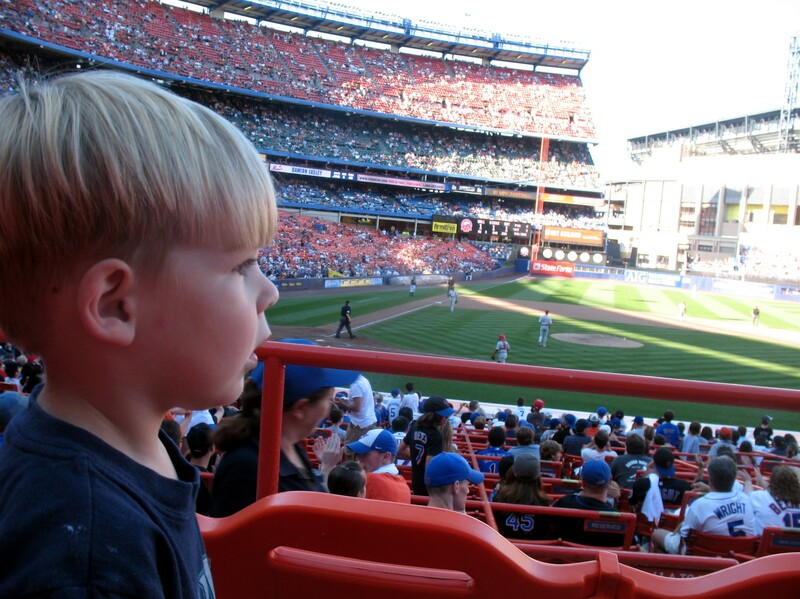 I can’t wait to get out to there and visit some of our favorite ballparks again, and several ballparks we have never visited before. Here’s a random, non-game-entry post for your Wednesday night. 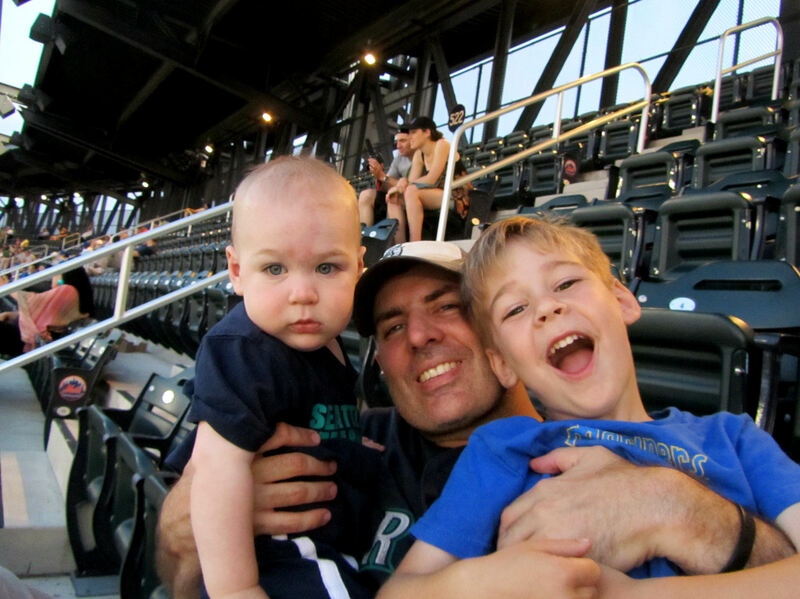 You might have noticed from our blog that I like to take a lot of pictures, to visit a lot of stadiums, and to make things out of wood (usually baseball bats). Well, these three passions come together on the wall of my home office. 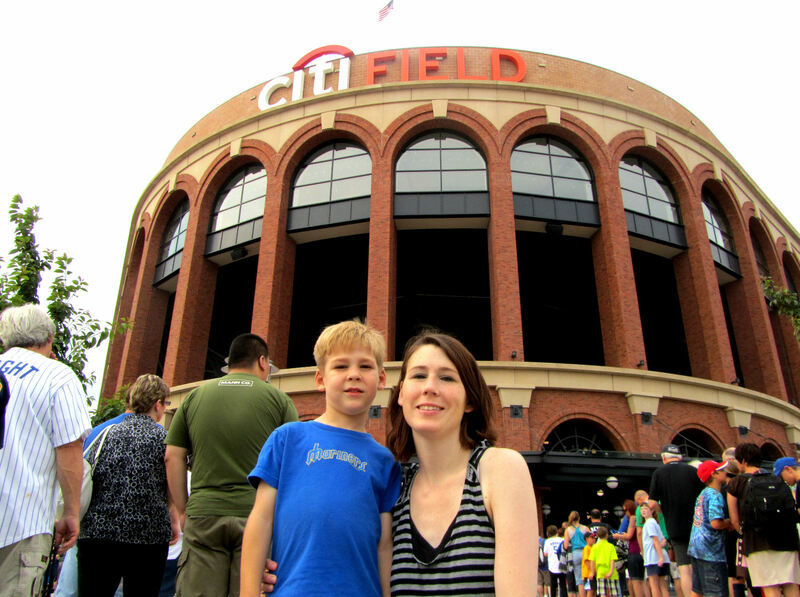 Last season, I made 5″ x 7″ frames to display pictures from the 9 stadiums Tim and I had visited together to that point. (FYI, that includes Safeco Field, Camden Yards, Citizens Bank Park, Yankee Stadium (1923), Great American Ball Park, Progressive Field, PNC Park, Shea Stadium and Chase Field). 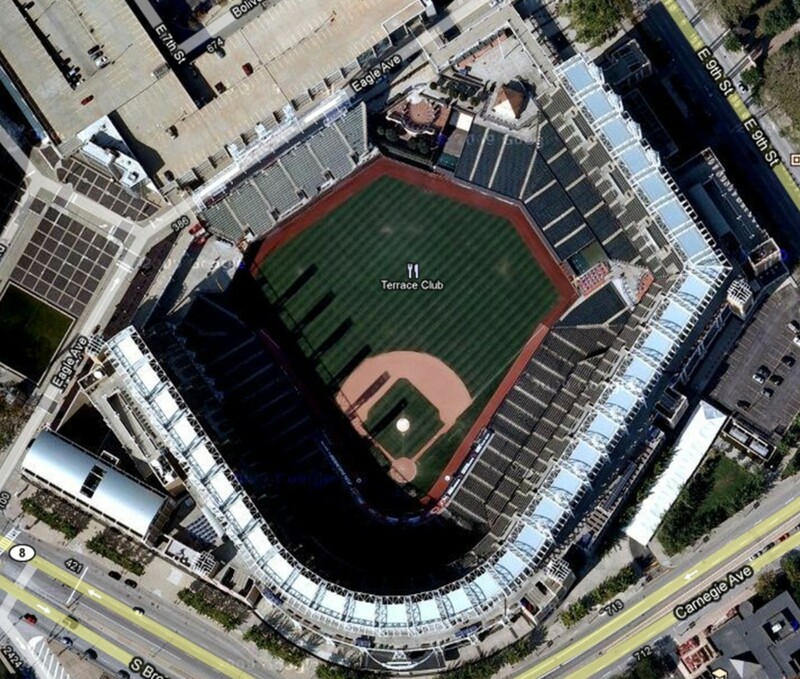 If you click on the picture, you will see that I added frames for the 9 new stadiums Tim and I visited in 2009: Citi Field, Nationals Park, Yankees Stadium (2009), Fenway Park, Wrigley Field, H.H.H. 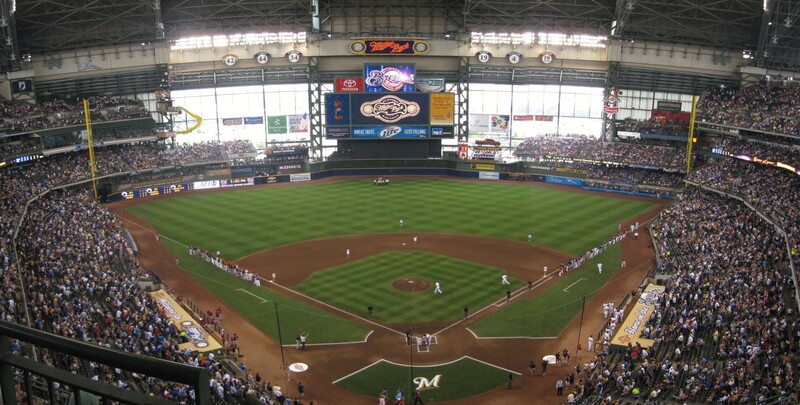 Metrodome, Miller Park, U.S. Cellular Field, and Rogers Centre. 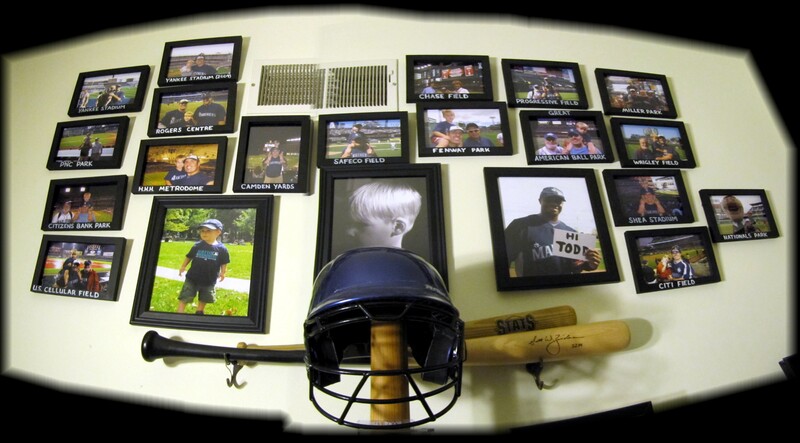 By the way, all of the links take you to the game entries that correspond with the framed pictures. 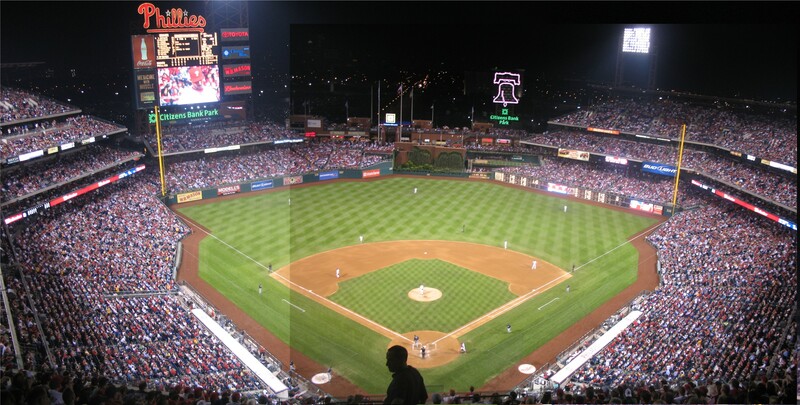 Also, I guess I should mention two more things: In the 8″ x 10″ picture of Tim just left of center, Tim is standing in Rittenhouse Square in Center City Philadelphia, just before his first game at Citizens Bank Park (his second game of his life). 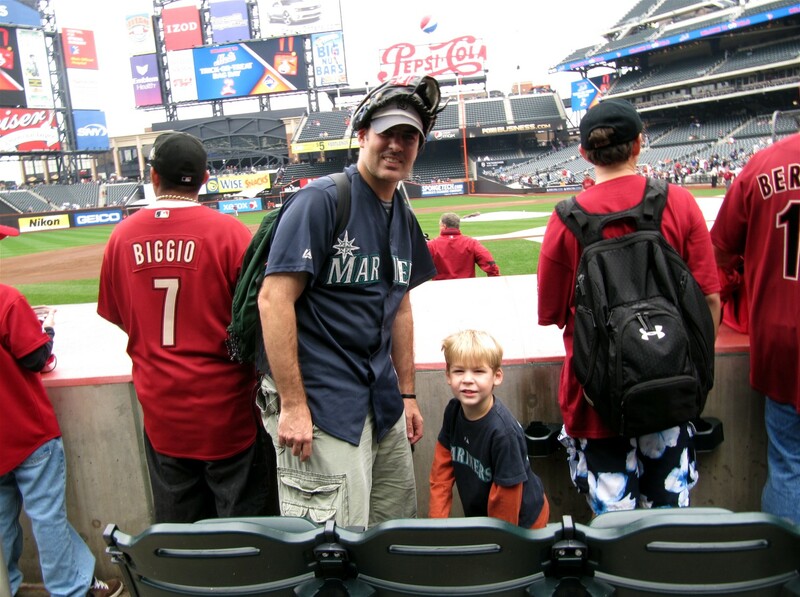 In the 8″ x 10″ picture just right of center, that is Ken Griffey, Jr. holding a sign that says “Hi Todd.” My mom had him pose for that picture on his first day of Spring Training in 2008 (literally, his first day back in a Mariners uniform) and my folks gave it to me for my birthday. Its good to finally be caught up with my frames. 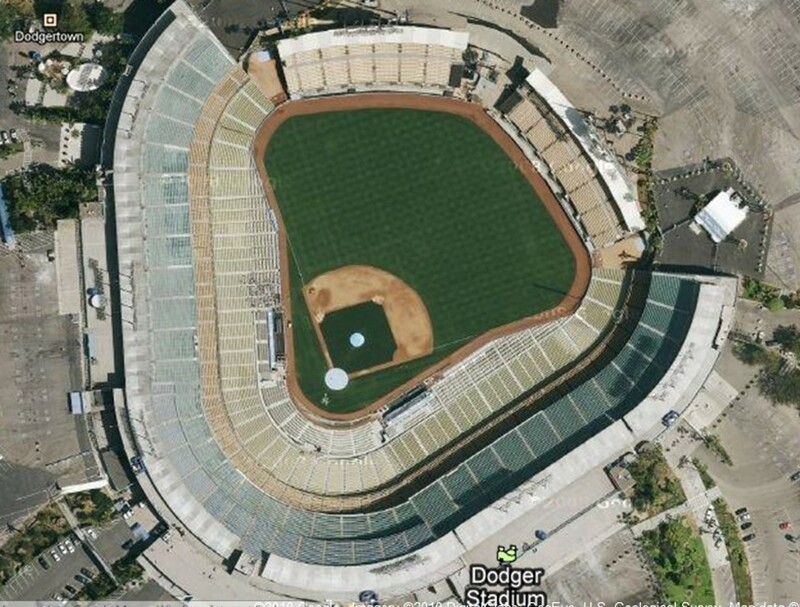 However, soon the 2010 season will start and we are set to add Dodger Stadium, Angel Stadium Not of Los Angeles, Petco Park, AT&T Park and the Oakland-Alameda County Colesium. 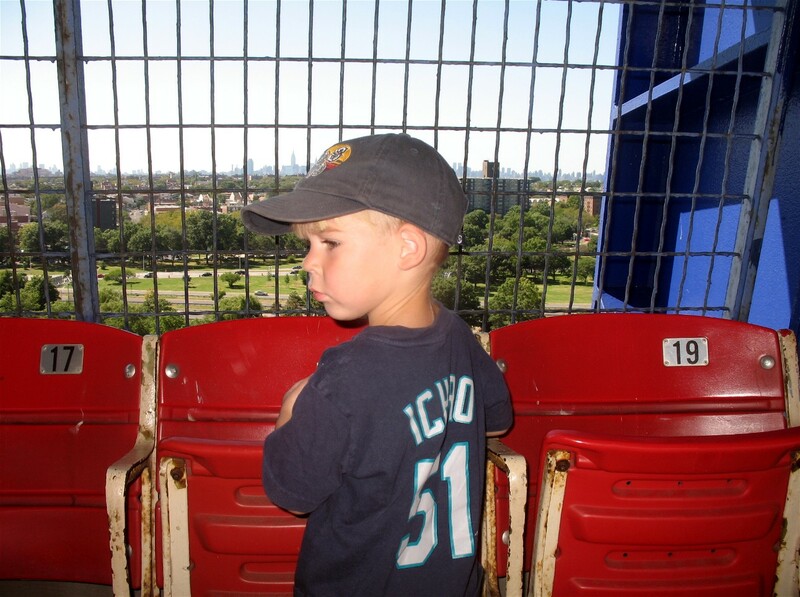 And, I’d really like to get to Comerica Park, but right now it is a long shot for 2010. 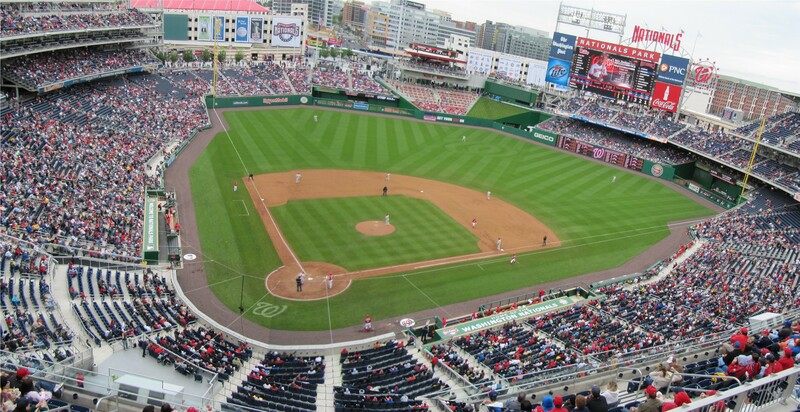 Its time to turn our panoramic attention toward the National League. 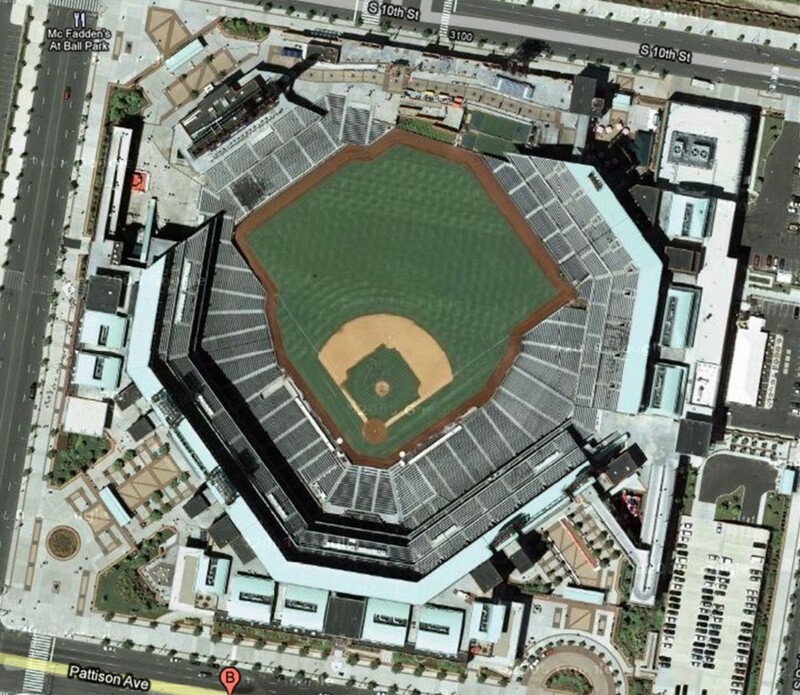 Scroll down to find: Chase Field, Great American Ball Park, Wrigley Field, PNC Park, Miller Park, Citizens Bank Park, Citi Field, Shea Stadium, and Nationals Park. 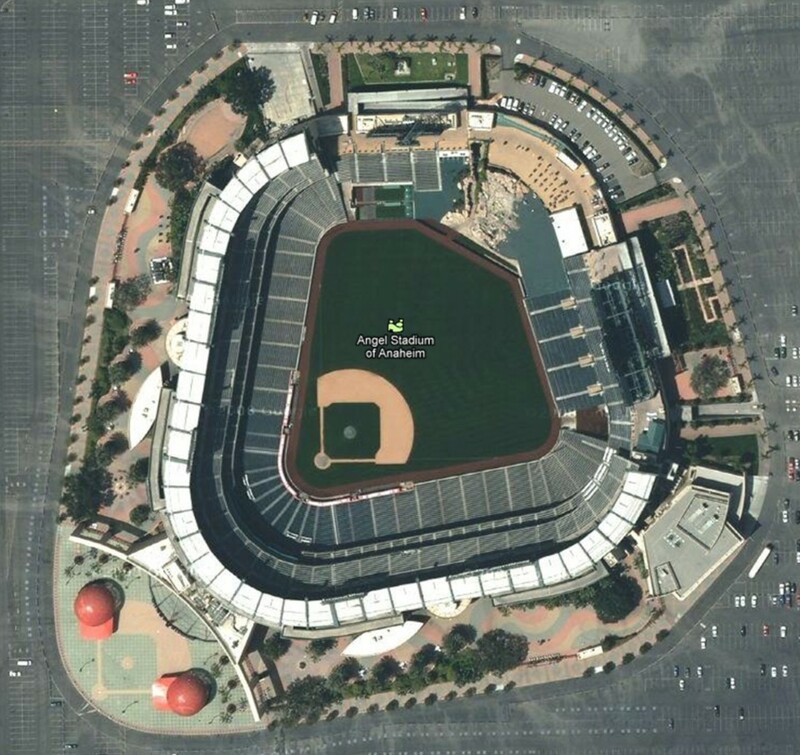 Coming later in 2010: AT&T Park, Dodger Stadium, Petco Park and more of many of the above. Citizens Bank Park scoreboard and Philadelphia from LF 300-level foul concourse: Citizens Bank Park section 344 at evening (standing room counter behind back row):. There you go. 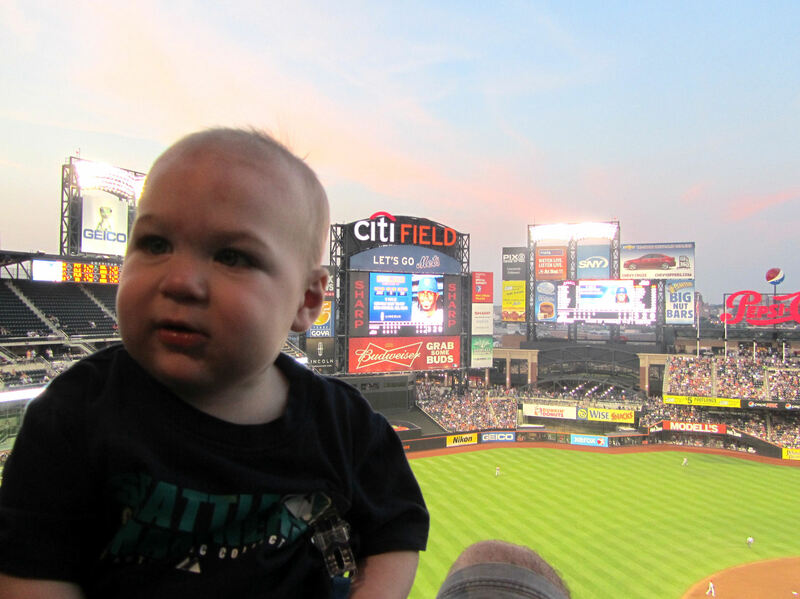 That is every NL panoramic ballpark view I have created and posted on our blog so far. 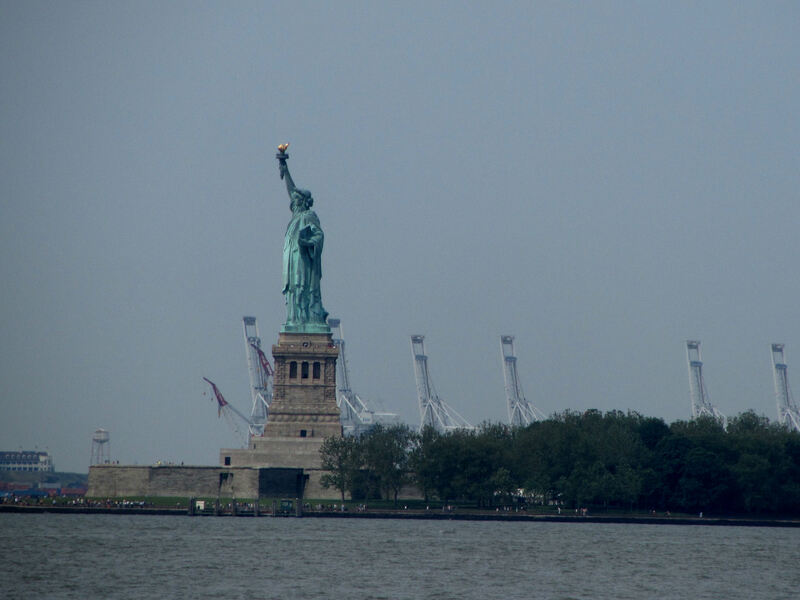 I love doing these, so check back in the future and there will be some new panaramics mixed in with these one. 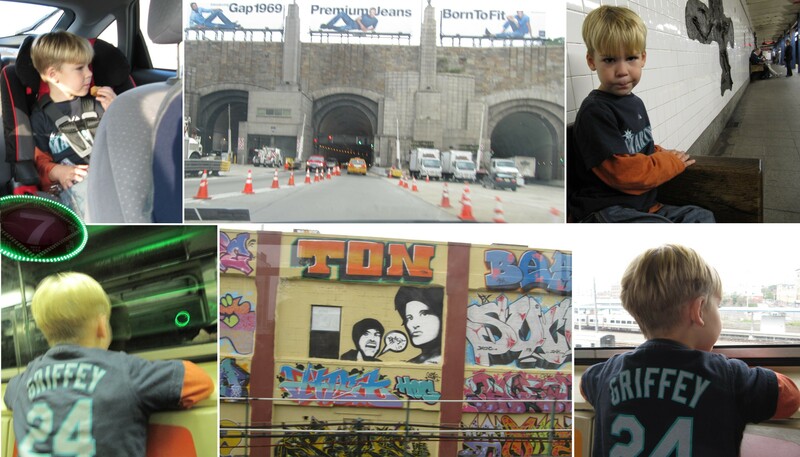 So, early in the morning on September 7, 2008, Tim and I hopped in the car and made our way up to Manhatten. 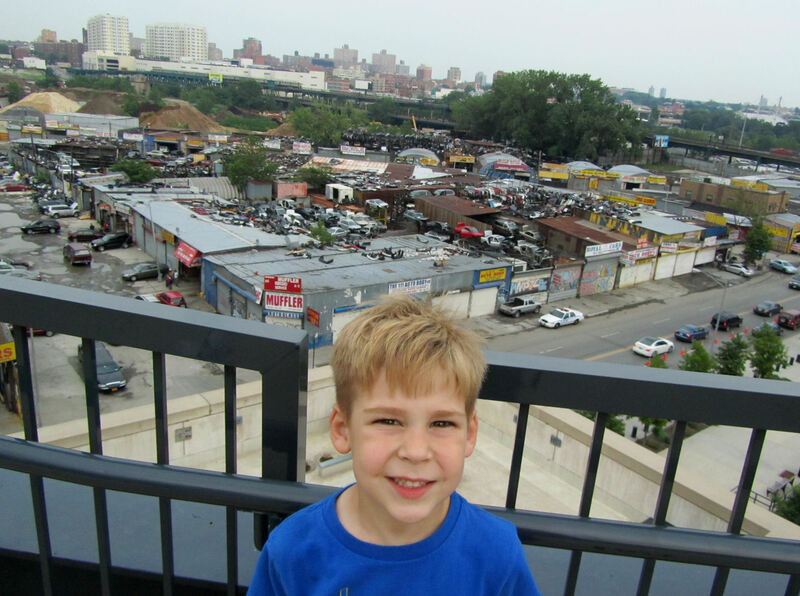 As is my standard practice, we parked on the upper west side. 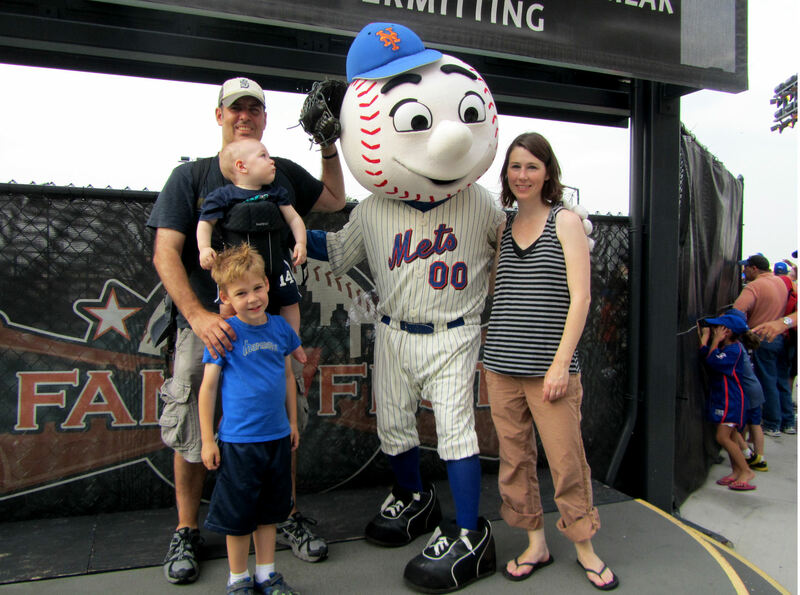 We then walked with Tim on my shoulders from approximately 84th & Amsterdam to 42nd & Seventh Ave. After a 7-train ride from Times Square station to Willets Point, we arrived at Shea Stadium. …that’s it just above the bill of Tim’s hat. 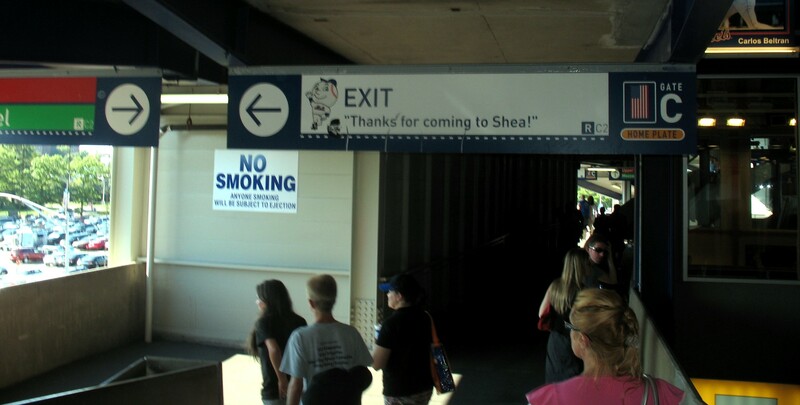 At least as I perceived it, Shea always got a bad rap. 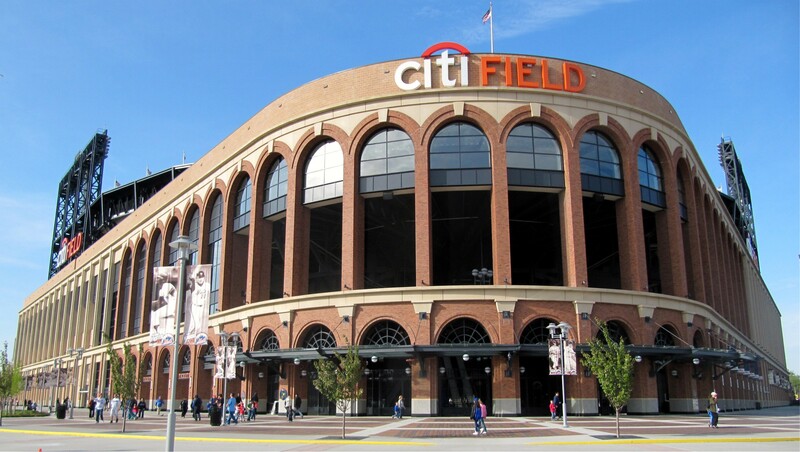 Particularly, because everyone glorified Yankee Stadium (which to me was utterly unimpressive — particularly when compared to the other “old” ballparks, Wrigley Field and Fenway Park). 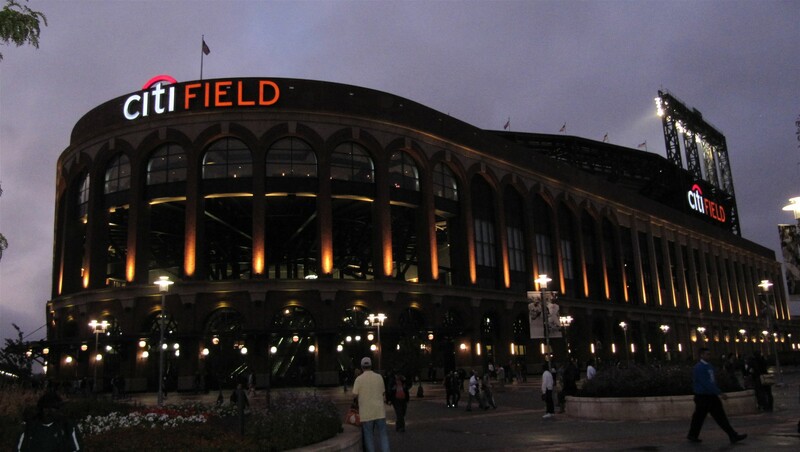 Anyway, I always liked Shea Stadium. 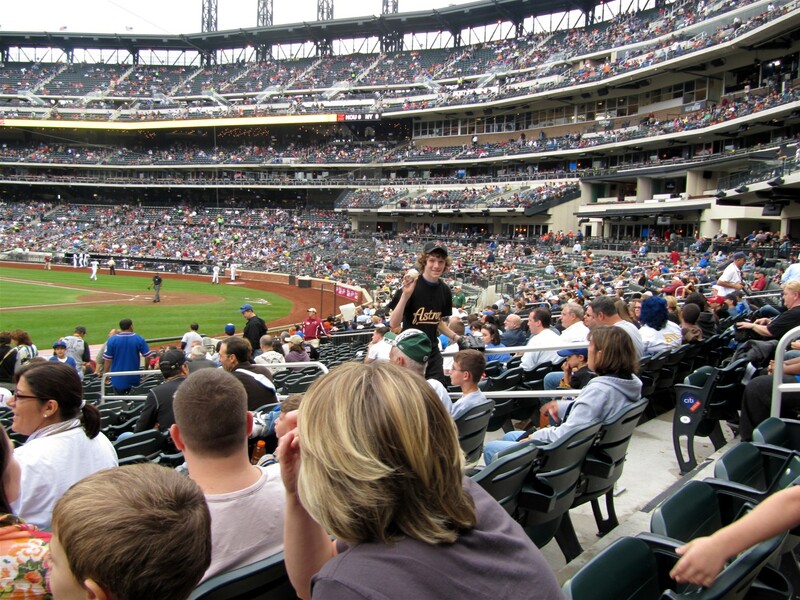 I probably attended 8 games total at Shea between 2000-2008 and I always found it to be a much more pleasant place to watch a ballgame than its neighbor in the Bronx. 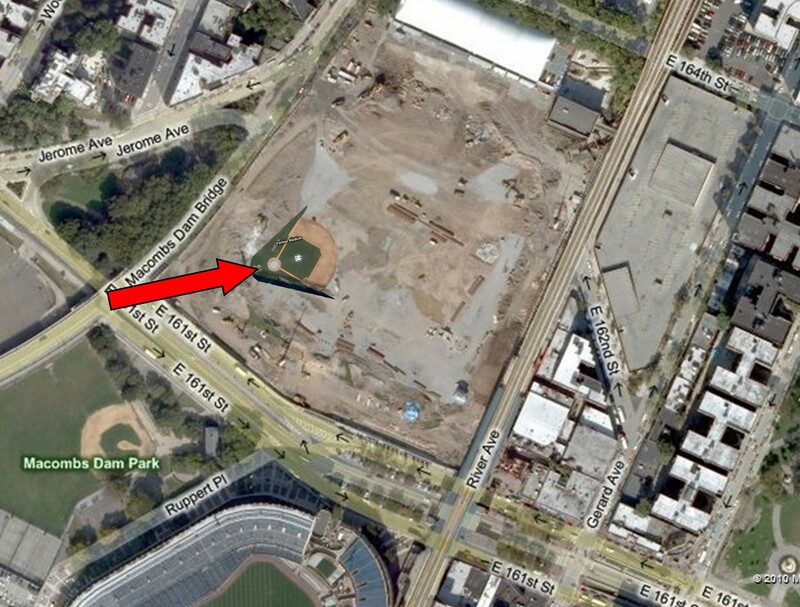 Note how Citi Field appears to be about 2 feet away from Shea beyond the outfield fence. 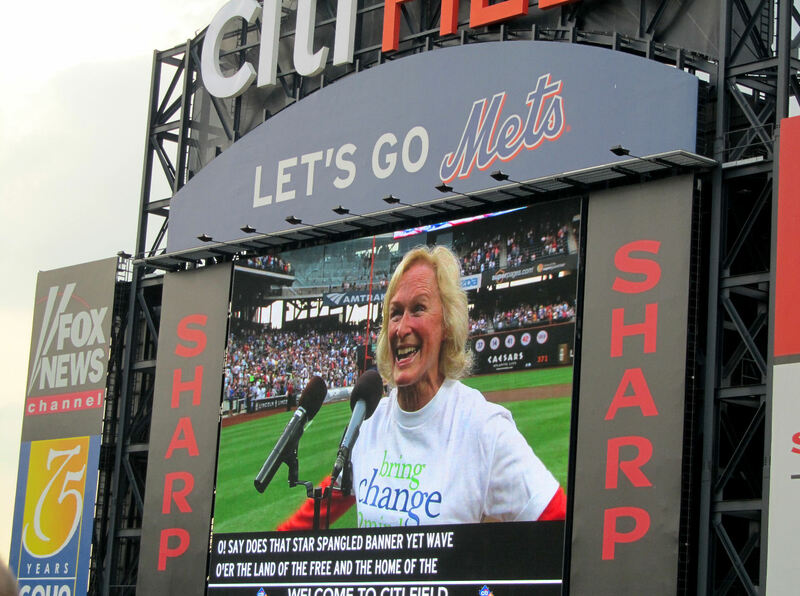 I was both amazed and saddened the following April when Tim and I attended our first game at Citi Field and we discovered that Shea was already demolished and hauled away. Soon, it was time for the game to begin. The atmosphere in the stadium was electric. 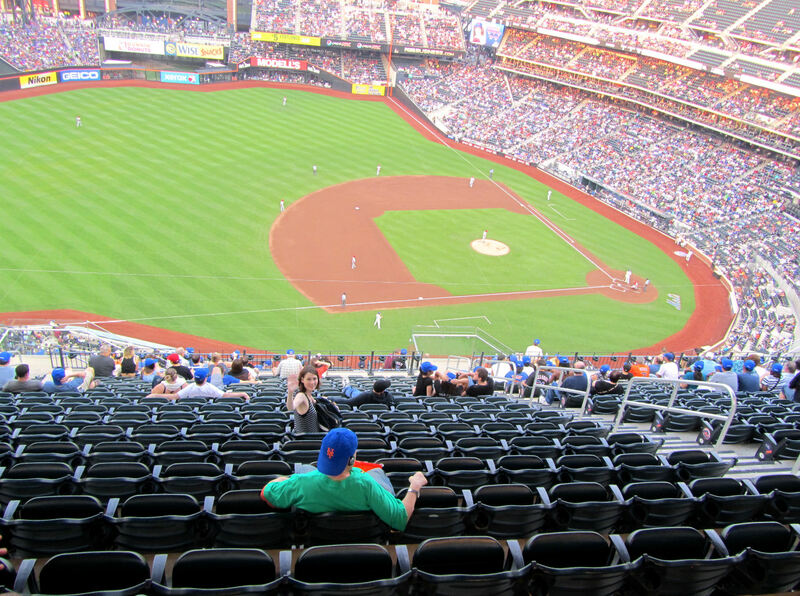 The Phillies and Mets are pretty big rivals. 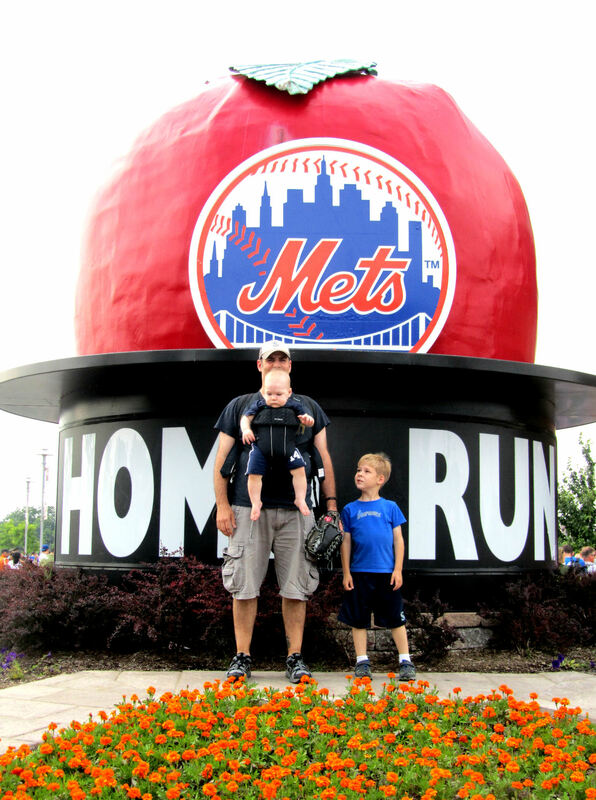 Entering the day, the Mets were leading the Phillies atop the N.L. East by two games. 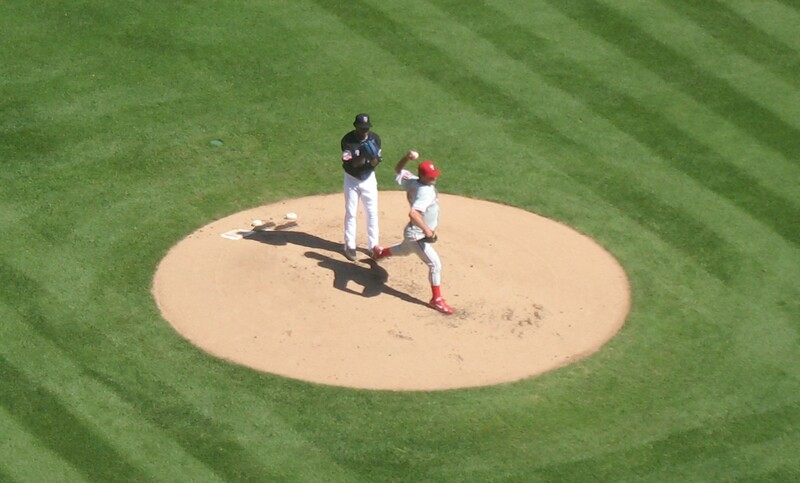 …by the way, “old goats” is Pedro’s description of himself and Moyer, not mine. 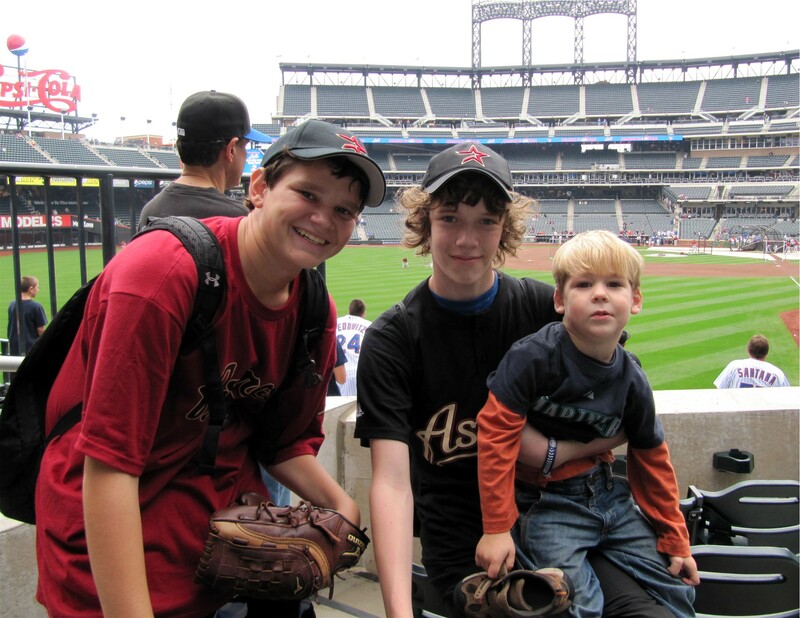 …my man, Moyer, would keep it up giving up only 2 hits and zero earned runs in 7 innings of work. 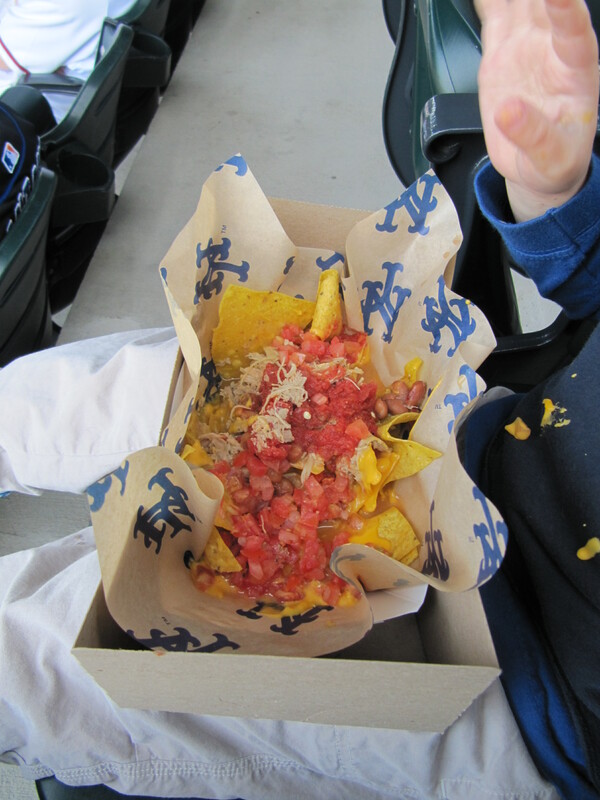 Pedro, however, would struggle starting in the second inning. 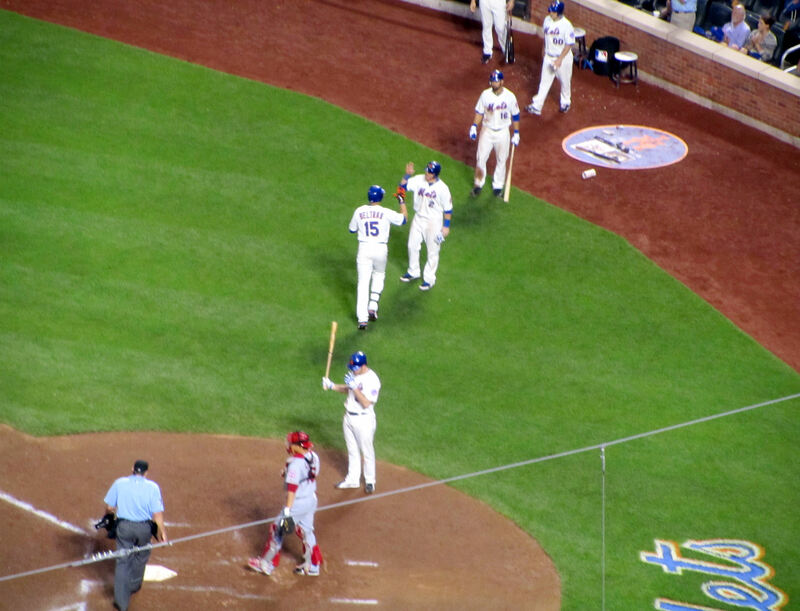 In the second inning, Pedro walked Jayson Werth. 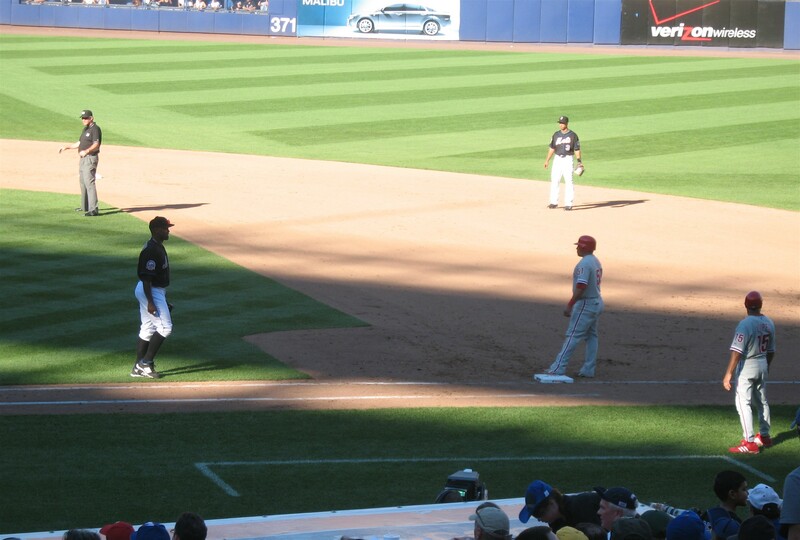 Former Mariner Greg Dobbs followed with a double, Matt Stairs with a sac fly, and Carlos Ruiz hit a double. And just like that, the Phillies led 2-0. 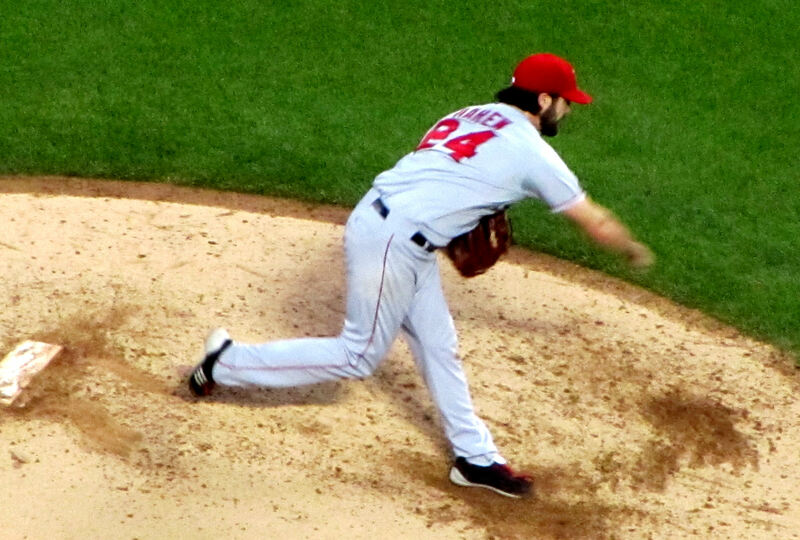 …Howard looked silly flailing at several pitches and ultimately striking out. 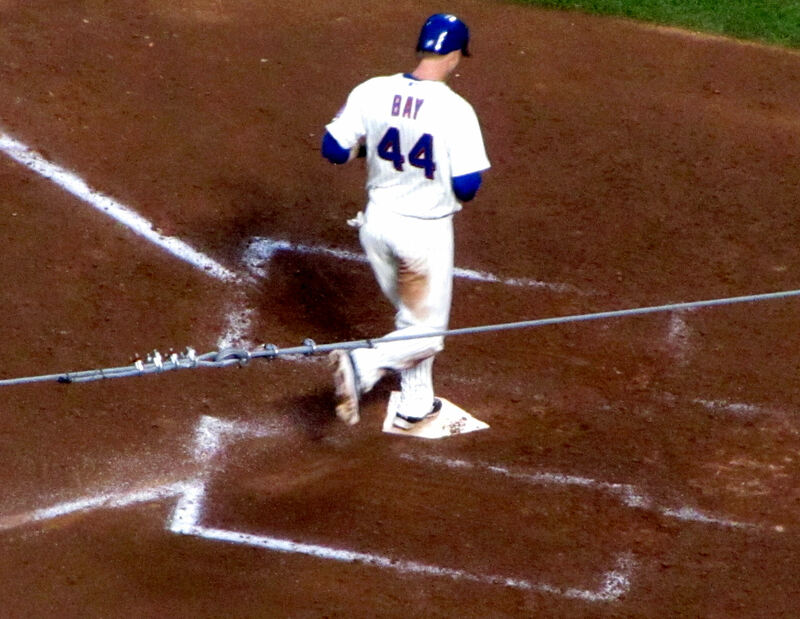 Moyer at least put the ball in play. 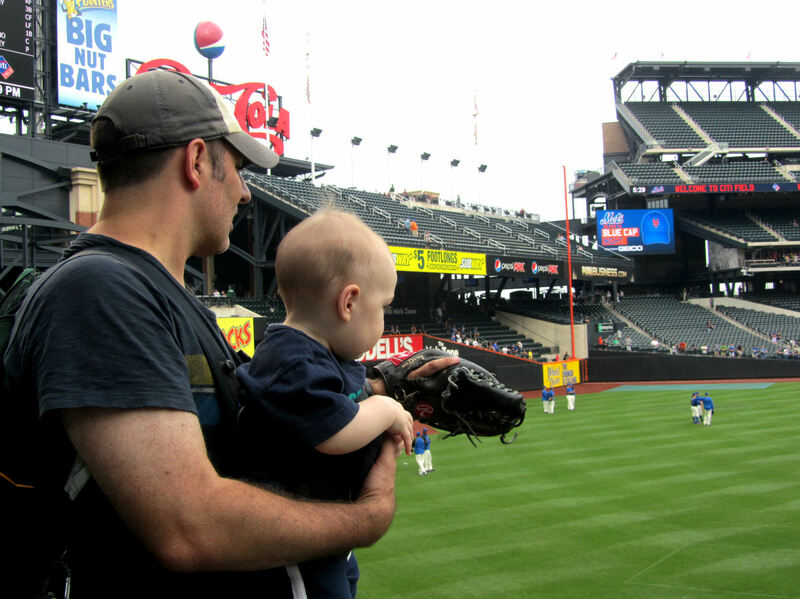 A couple innings into the game, we decided to explore the stadium a bit. I knew this would be Tim’s only chance to ever see Shea. So I wanted us to see what it had to offer. 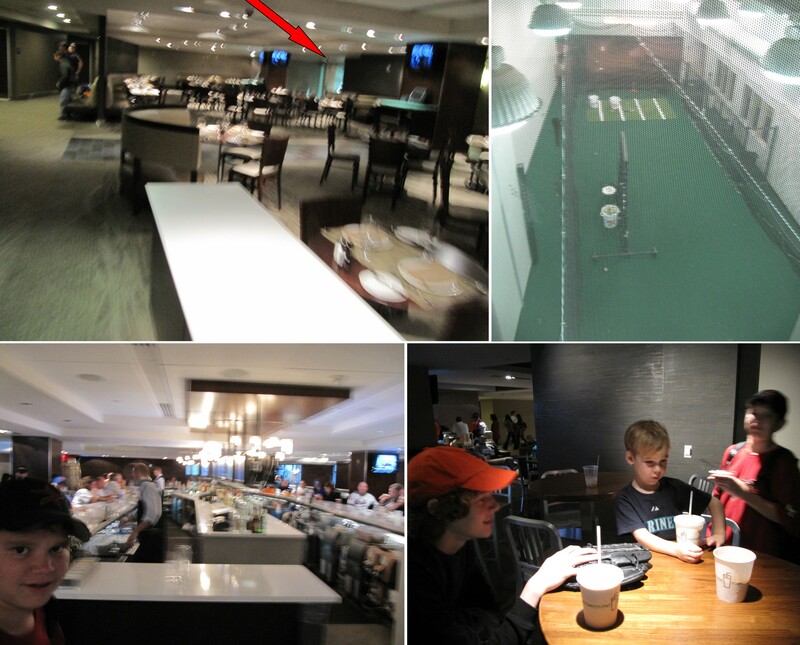 …I think that picture to the left is pretty interesting. 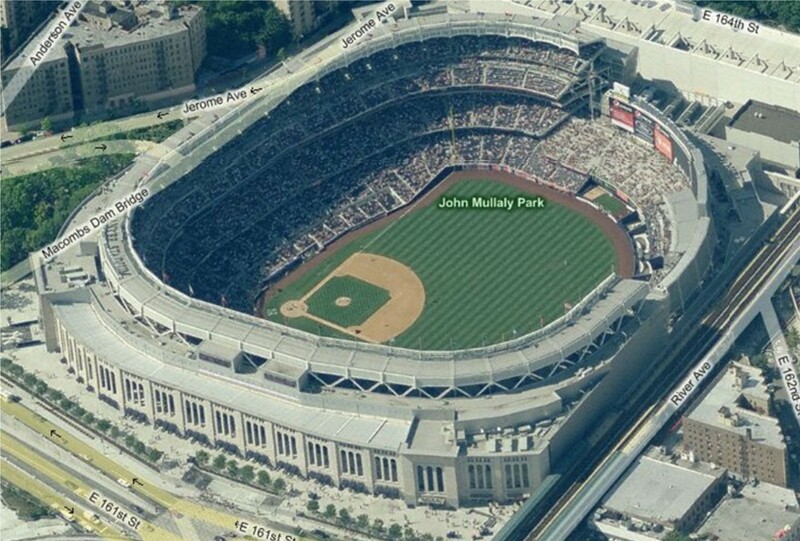 It shows that Shea Stadium had two sets of ramps circling the stadium. 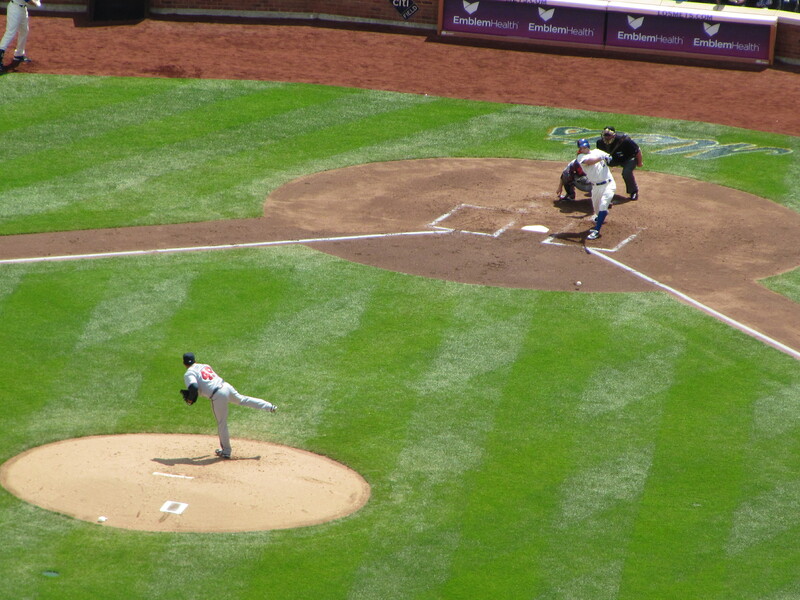 Moyer was still pitching a gem. With a win in this game, Moyer would run his record to 13-7 on the season and it was his 243rd win of his excellent career. 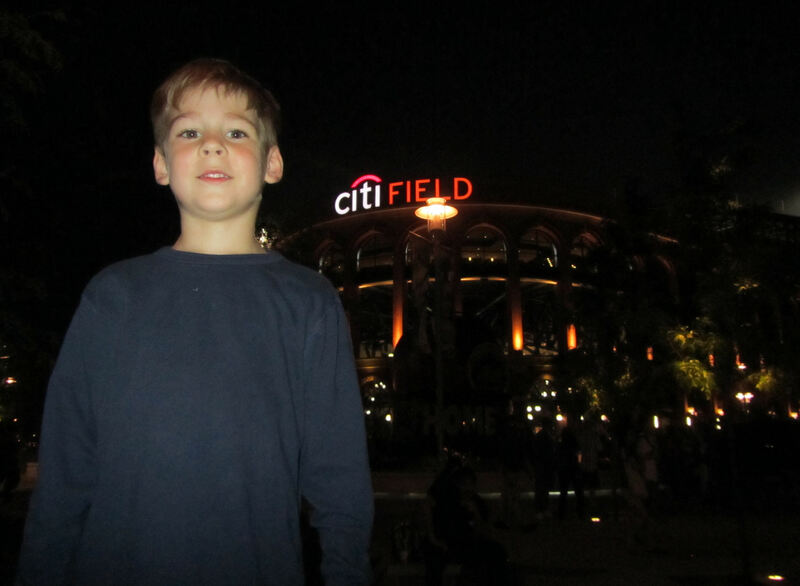 I had never done much exploring at Shea before. But I knew there were some standing room areas down each foul line. 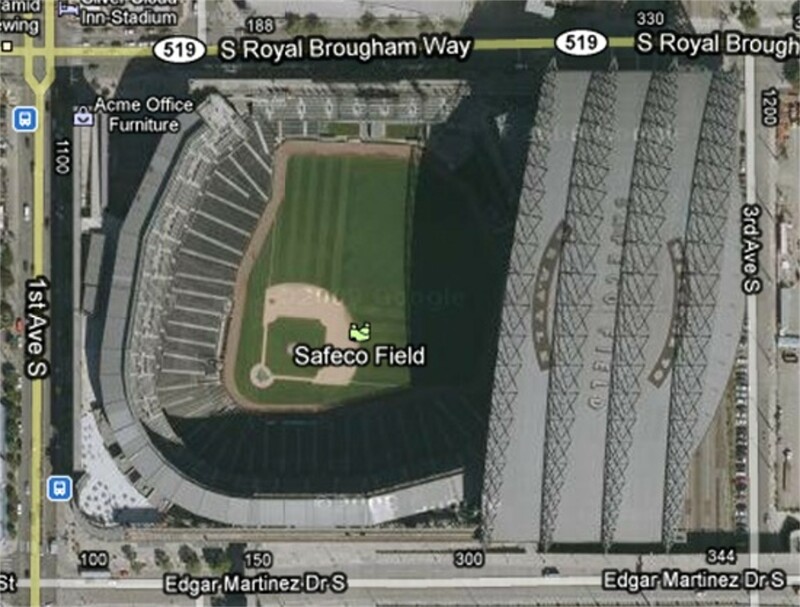 So that’s where we headed out in RF. As you can see, the standing room area is in an inside concourse with a screen in front of it. 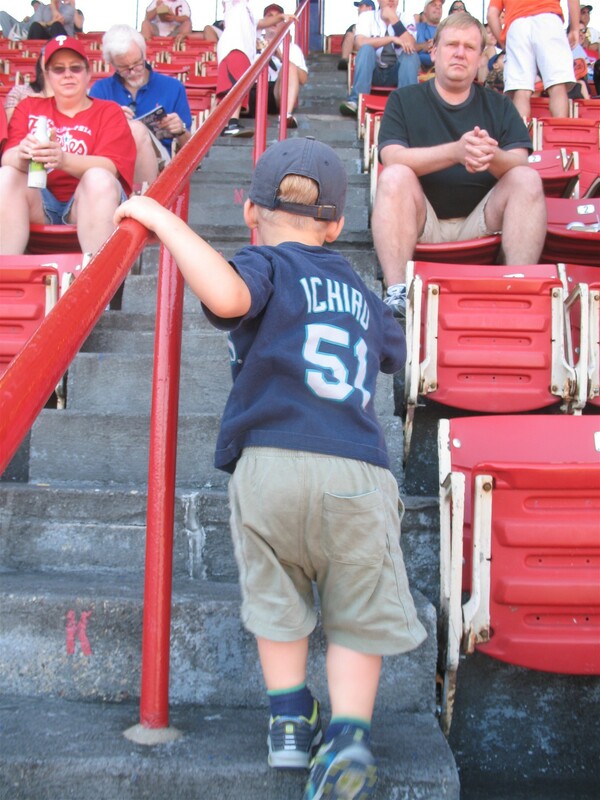 Back in 2003, I watched almost an entire game from the corresponding standing room area down the LF foul line. Its a nice little spot. 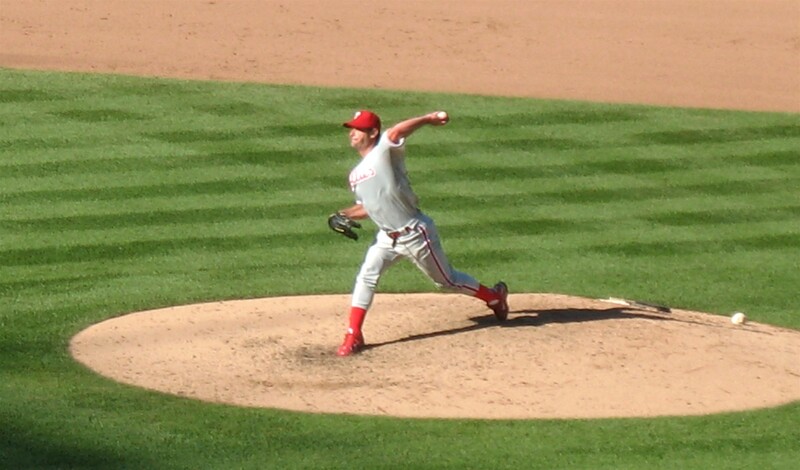 Interestingly, that other game I watched from the standing room area was also part of a Sunday doubleheader and it was also a 7 inning, 2 hit, zero earned run win by Jamie Moyer. Tim and I hung out there a little while so Tim could run around in circles. ….which I thought was pretty interesting. Seems like most stadiums have ketchup and mustard pumps, not little packets. 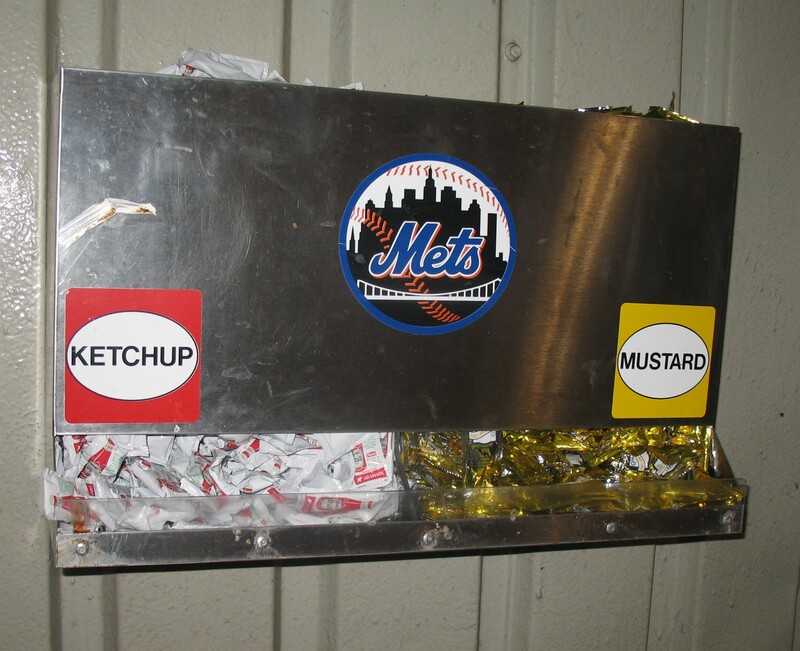 I wonder if someone bought this ketchup and mustard contraption once the Mets started trying to sell off any-and-everything from Shea Stadium. Actually, if you want one of these, click here. 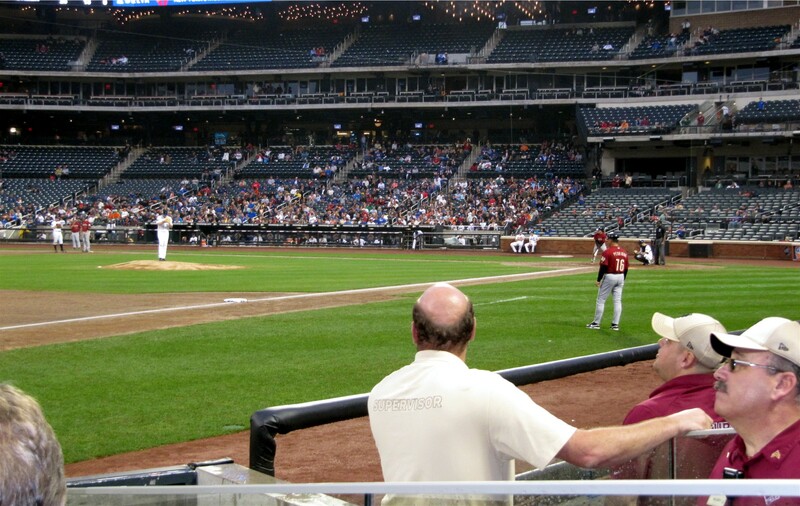 We saw that there were plenty of empty seats toward the home plate area. This wasn’t a planned doubleheader and it wasn’t a make-up of a game from early in the season. No. This game was supposed to be played the night before. 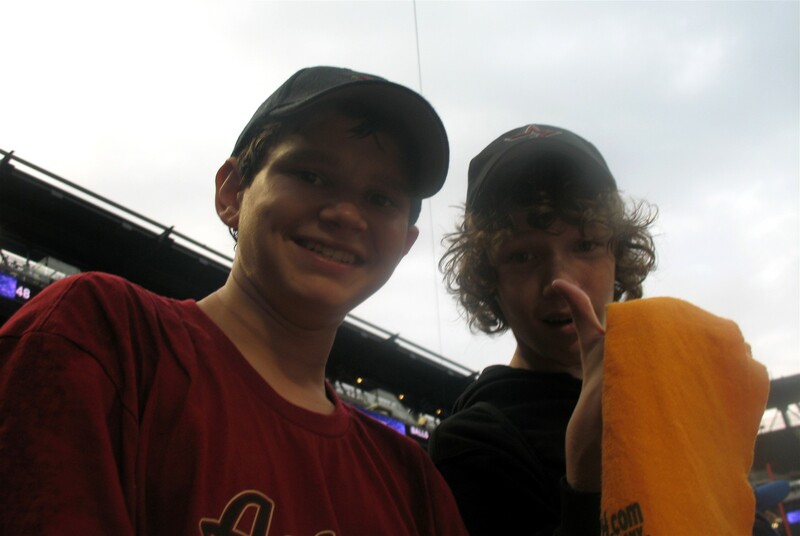 In fact, we had planned to attend the game on September 6th. Anyway, it appeared that some of the people who planned to attend the game on the 6th couldn’t make it on the 7th. And we were the beneficiaries. 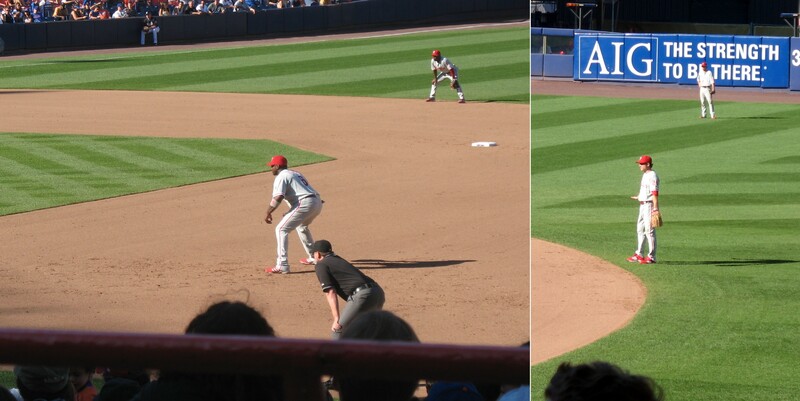 …Ryan Howard, Chase Utley and Jimmie Rollins each had one hit on the day. But the big hitting star of the day was Greg “The Dobbers” Dobbs who was 2-4 with a 3-run 4th inning homerun off of Pedro Martinez. He also scored 2 runs. After the 4th inning, the Phillies led 6-0. 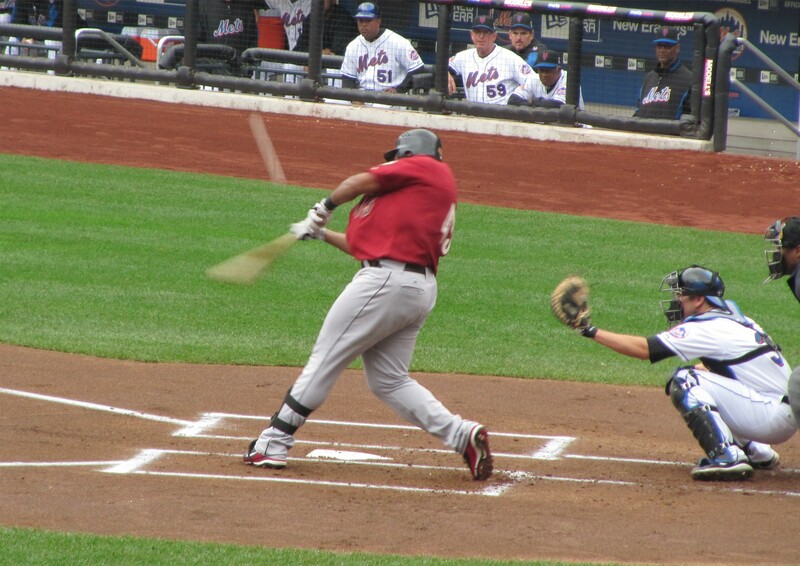 …like this pitch to Phils third basemen, Pedro Feliz. …who went 0-4 on the day. Pedro Martinez only lasted 4 innings and left trailing 6-0. A host of Mets relievers finished off the fifth through ninth innings without giving up any more runs. 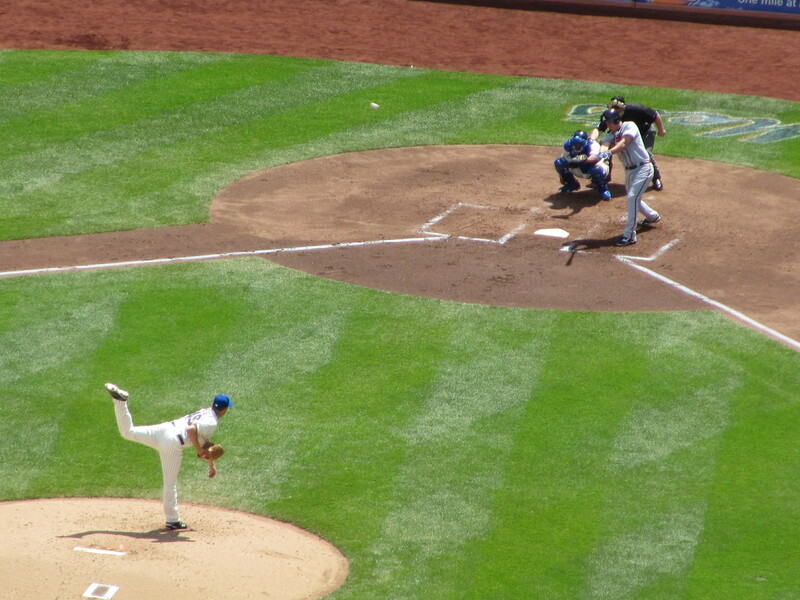 Moyer lasted 7 innings before Scott Eyre came in and gave up the only two Mets runs in the 8th inning. 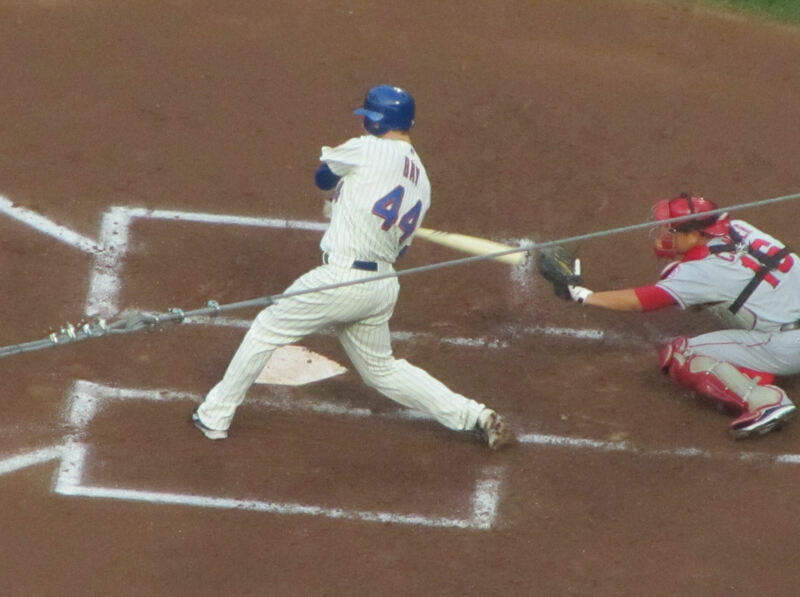 The Phillies won the game by a final score of 6-2 to move to 1-game back of the Mets. 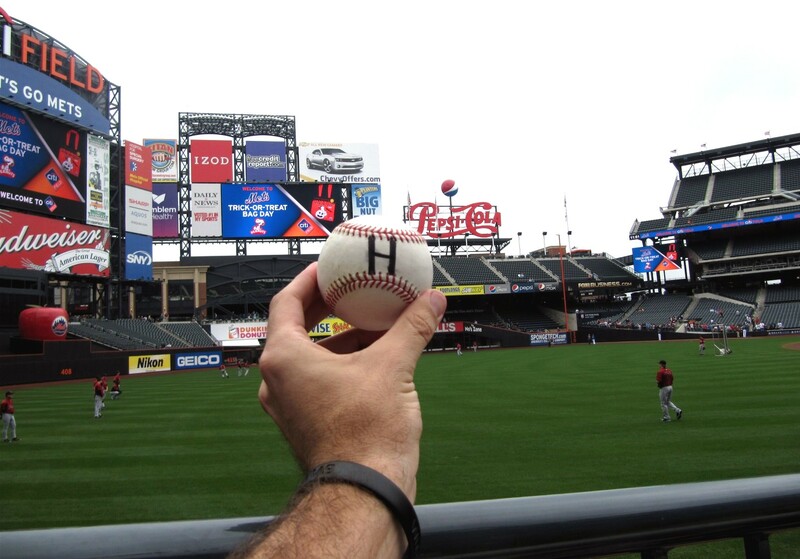 In the nightcap, Johan Santana beat Cole Hamels and the Mets re-took a 2-game lead in the N.L. East, a lead they would build to 3.5 games a few days later and then squander to miss the playoffs completely. 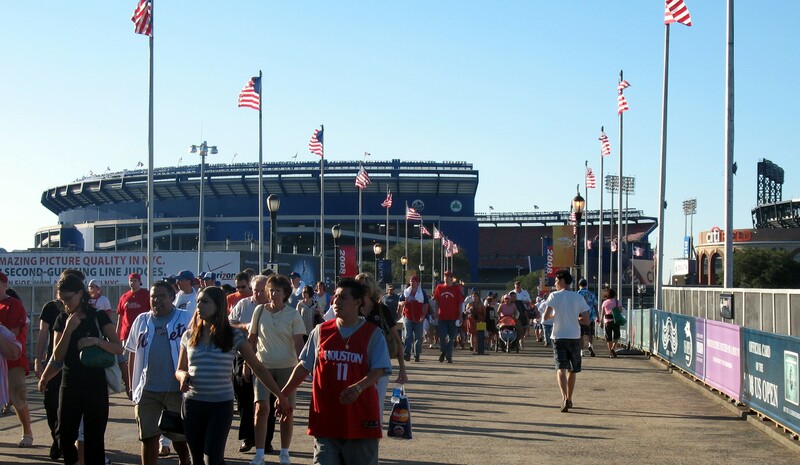 The crowd made its way out of the Stadium, many of them like us never to return. 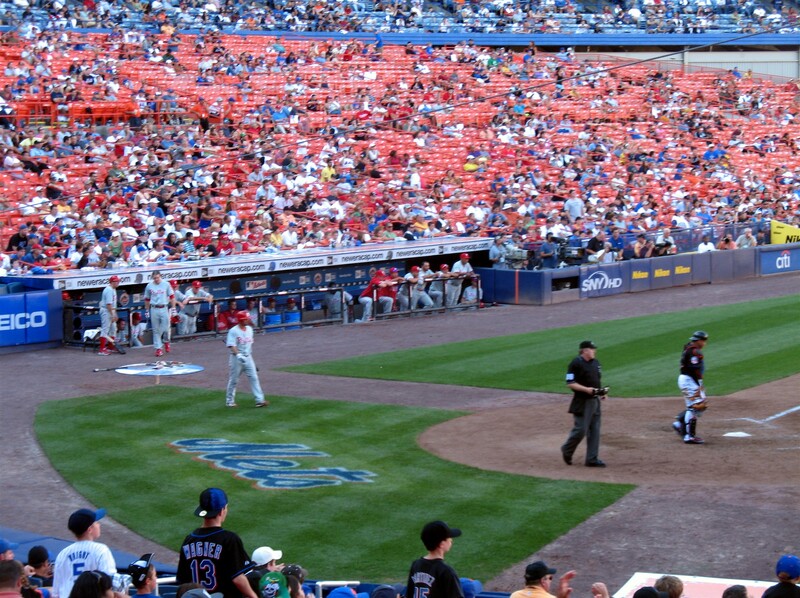 The next time we traveled to Queens, it would be to visit the new Citi Field, and many people like us would miss the simple and stripped down charm of Shea Stadium and its brightly colored seats.